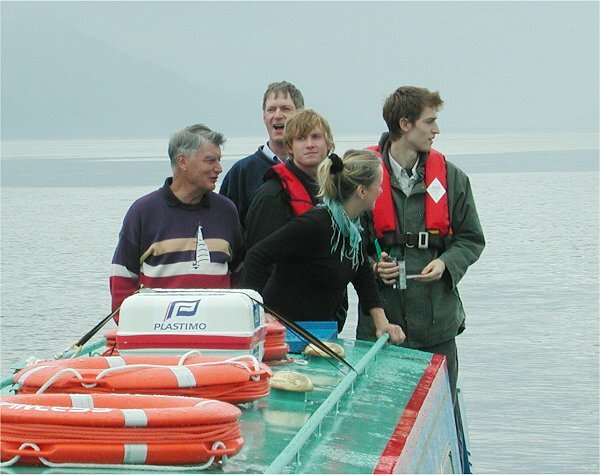 Heather Mc Lean, wife of a local fisherman that had befriended John on his explo came sharpish at 07:30 to give Jane a lift to Oban Station. She came already dressed in her Tesco uniform ......somewhere we desperately needed to go! 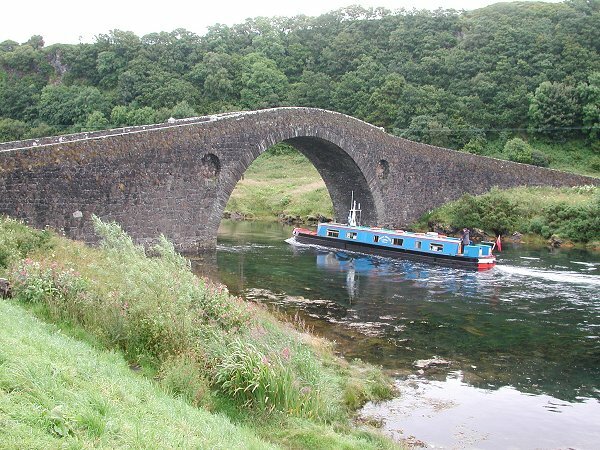 We soon set off back to do another sweep through the Clachan Bridge, Neil and Robbie were set down to take pictures. 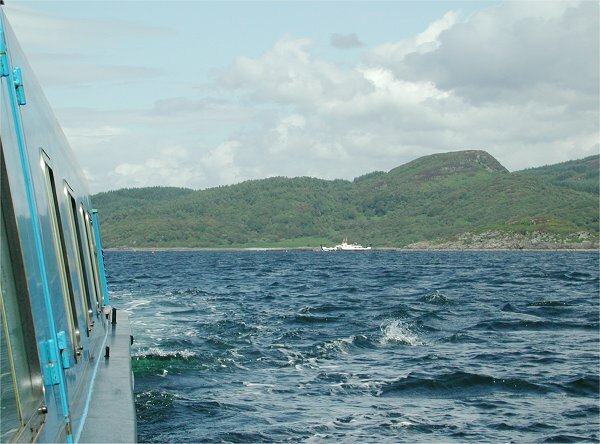 A pleasant, sunny morning as we set off down the Sound of Lunig, passing Balvicar. 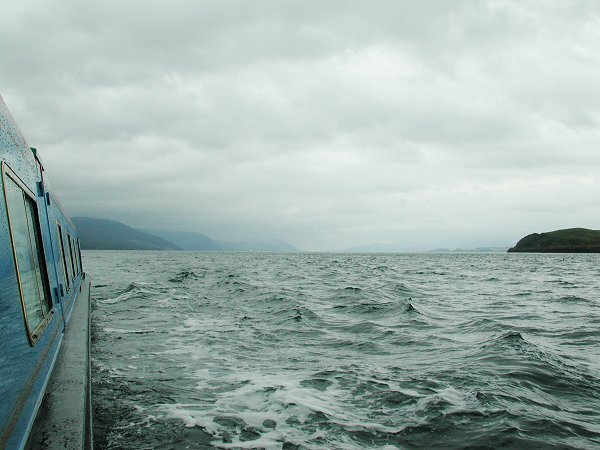 Once we were past the Isle of Shuna we went inside a few islands, missing the Gulf of Corryvreckan, but passing through the lesser area of whirlpools known as Dorus Mor. 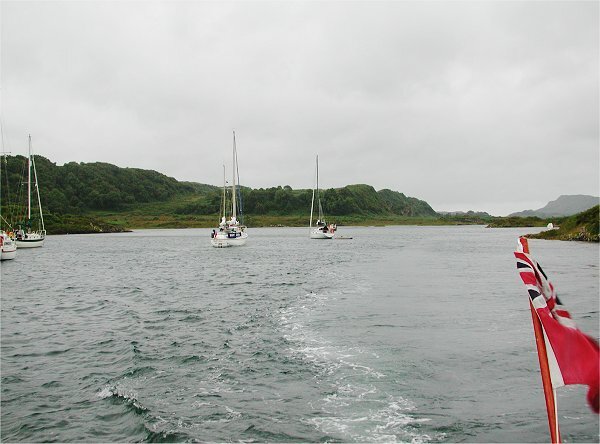 These were rather tame and we were not deflected from our course to Crinan. 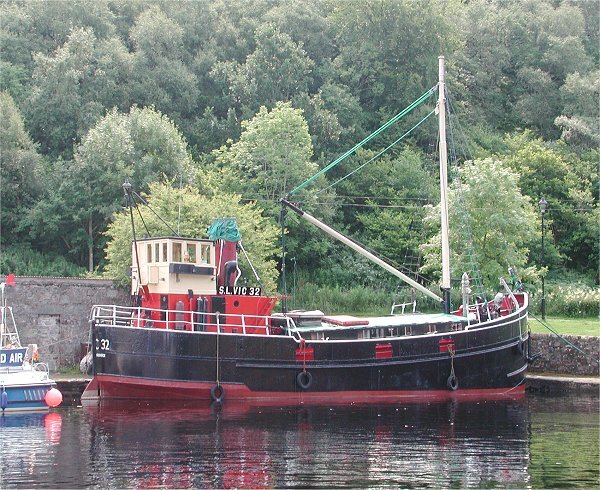 Crinan Sea Lock was made at 11:15 and were soon up in the basin moored alongside the Clyde puffer "Vic 32". 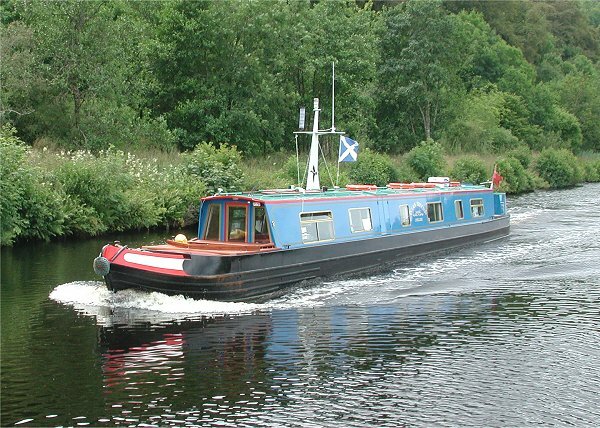 We chilled out for a bit and after visiting the marina and tea rooms we started off up the canal at 13:20. 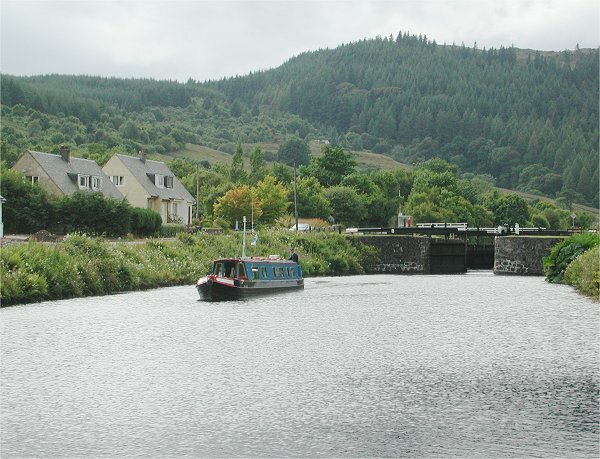 The canal has a rather pretty summit up and over to Cairnbaan, where we arrived at 17:00, for a nice meal and a pint in the Cairnbaan Hotel. Early to bed as even JC was feeing tired! 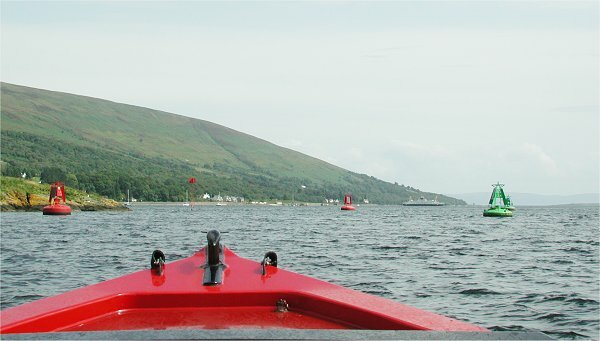 We shoved off from the pontoon we had shared with a Dutch yacht at 07:30, just behind a local yacht from Holy Loch. 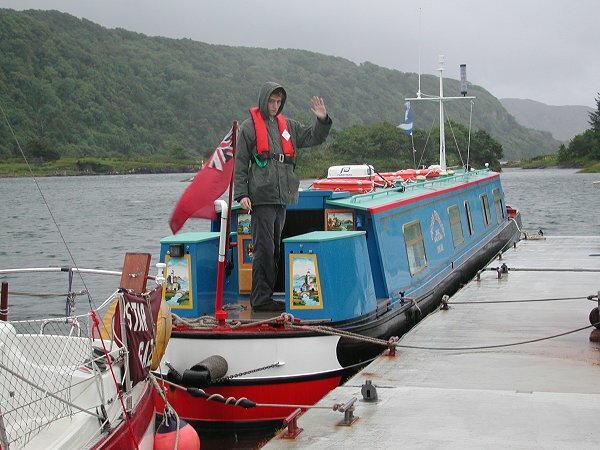 We had decided to go round the Isle of Bute, so in the first lock JC chatted up the locals for info on their marina. 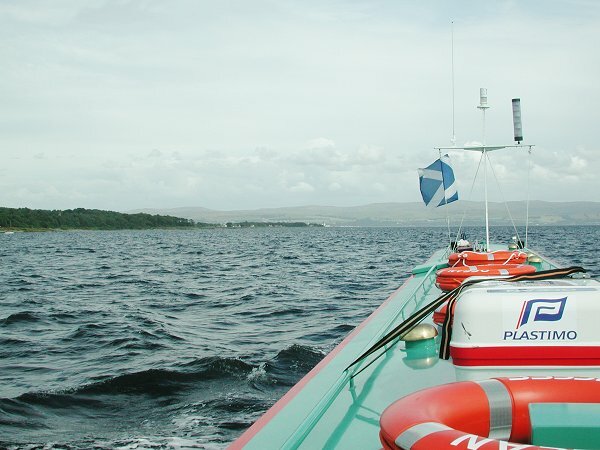 After a quick refuel, water top up and provisioning we locked out of the Crinan Canal at Ardrishaig at 10:50. 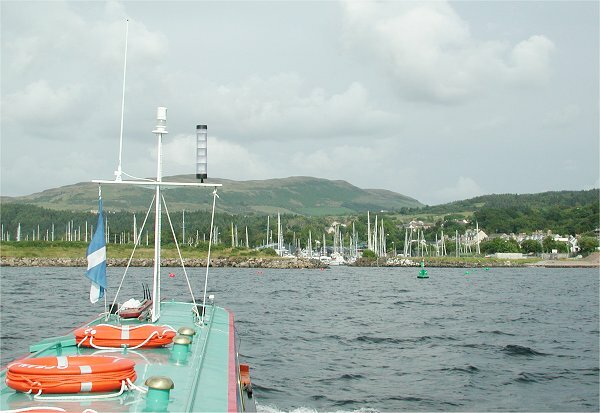 Once clear of Loch Gilp we carried on down the bottom of Loch Fyne, then round the Kyles of Bute and across the Firth Of Clyde to the newish marina at Inverkip, narrowly missing the cruise ship Constellation coming out from Greenock. Arrival was at 17:25. 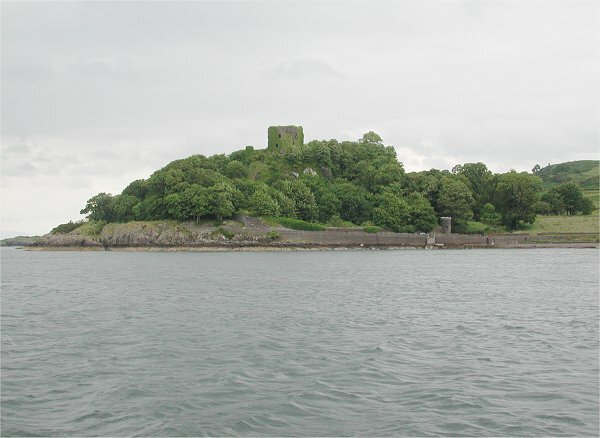 James and Robbie went out to the reasonably priced marina restaurant, John and Neil stayed onboard. 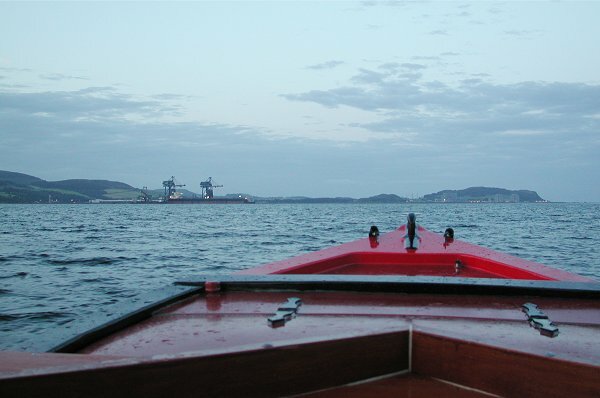 Early 03:20 departure from Inverkip. 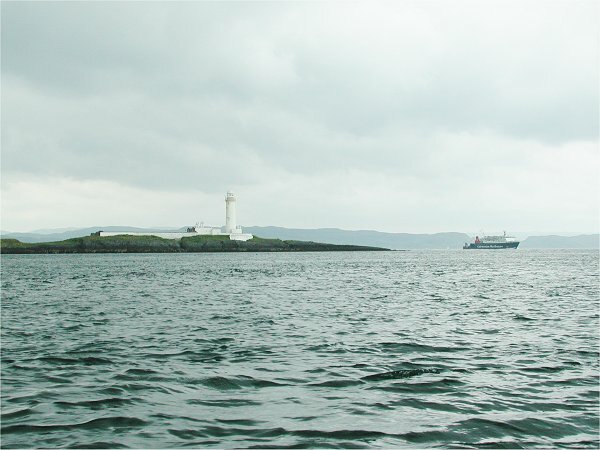 Little Cumbrae Island passed at 05:40. 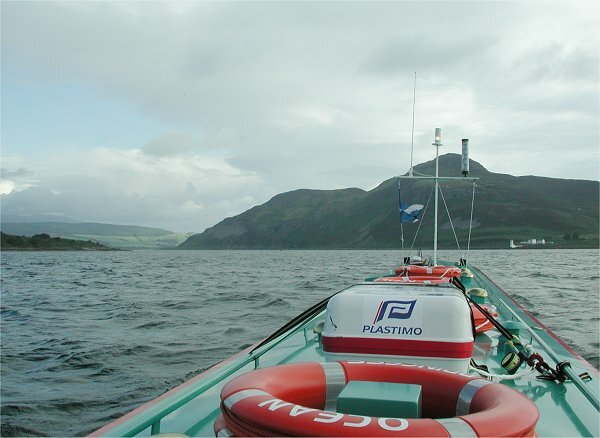 After this it began to blow up a bit (by now around Force 4 moderate) and come the passing of Holy Island we turned tail and went for shelter in Lamlash Bay, arriving on a pay buoy at 09:15. 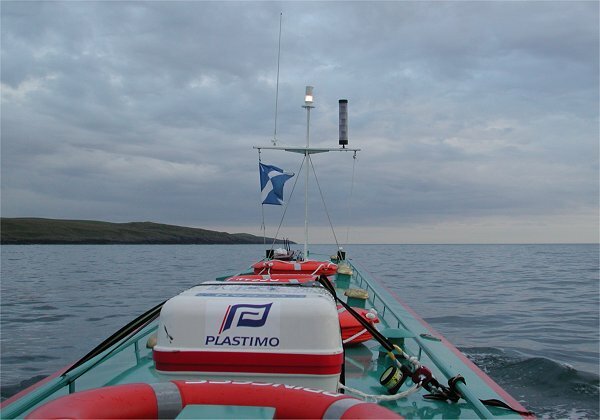 After a few hours the wind dropped and after a weather check we set off again at 13:10, bound for at least Loch Ryan (Stranraer) or maybe round the Rhins Of Galloway if the weather stayed OK.
Pladda lighthouse passed at 14:35 and we then set our sights on Ailsa Craig. 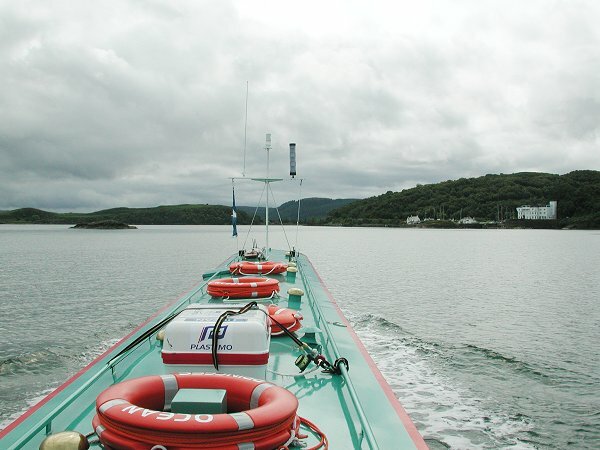 John wanted to see the more spectacular western side of the island, so we set ourselves up for missing out Loch Ryan and carrying on out into the North Channel, skirting the Rhins of Galloway. 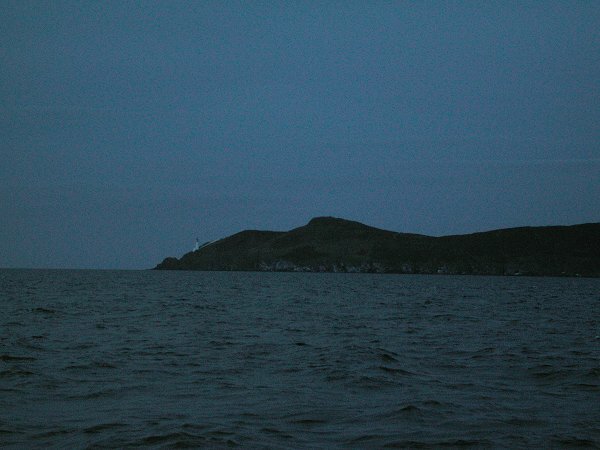 Corsewall Point was passed at 20:00, Black Head at 21:30 and Portpatrick at 21:50. 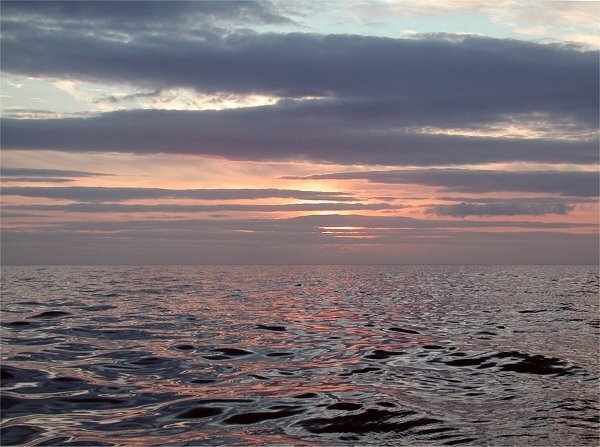 All the time the weather improved, with sea state coming down to calm and a spectacular sunset. 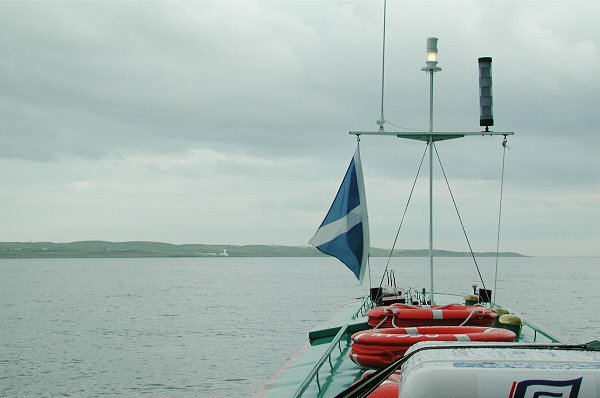 So around 23:30 we passed The Mull of Galloway and carried straight on down towards the Isle Of Man. John steered the last bit, Point of Ayre at the top of the IOM was passed at 03:40. 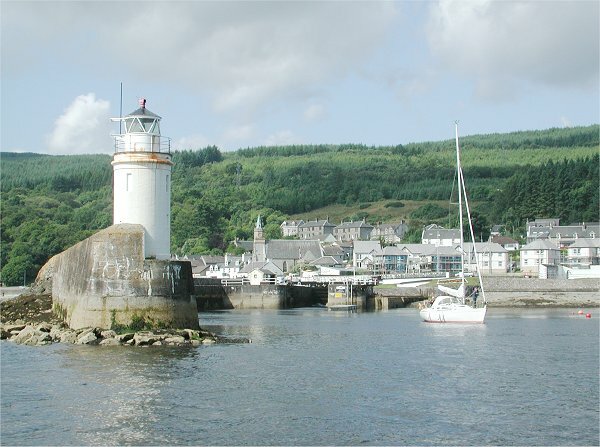 Then followed a misunderstanding, John had booked us into Ramsey, the other side of the swing bridge......other than when contact was made with the IOM port control we found out we had in fact been booked into Douglas, which also has a lift bridge over the half tide weir to the inner harbour! 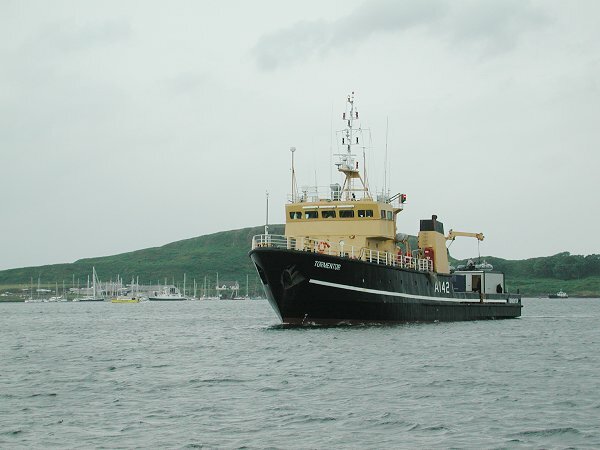 So it was Ramsey (pass) at 04:20, Maughold Head at 05:35, Clay Head 06:45 and in at the outer harbour at Douglas at 07:30. Booked time for the half tide weir and through the lift bridge into the inner harbour was at 14:00, so James and Robbie stayed onboard for a sleep, while John and Neil set off to check out the IOM railway system. We found the transport shop open so got ourselves a go anywhere one day pass for 10 quid, then recovered from our 26.5 hour ordeal by having a mega breakfast fry-up in "The Caff". The first steam train out of Douglas was at 10:10. After an out and back to Port Erin we caught a bus to Laxey, then did the Snaefell Mountain Railway to the summit (which was still clear), then the Manx Electric Railway to Ramsey and back to Douglas, finishing off with the horse tram along the front. As we fancied fish and chips we decided to finish of our tour of the island with a bus ride to Peel, where we found an excellent harbour side sit down chippy. The port area was just recovering from a days Viking boat racing........shame we did not arrive here and enter Ocean Princess! 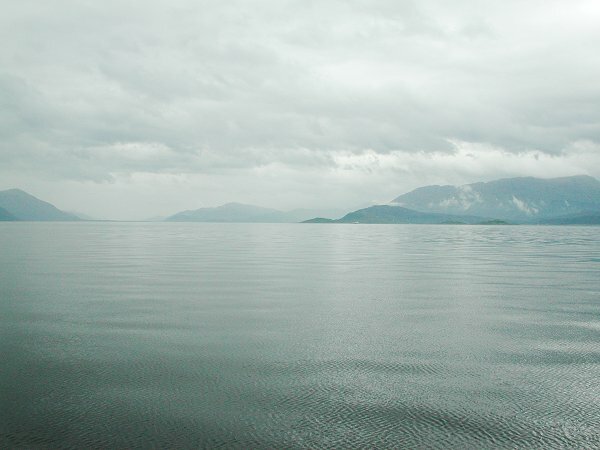 Looking down Loch Linnhe to Corran Narrows. 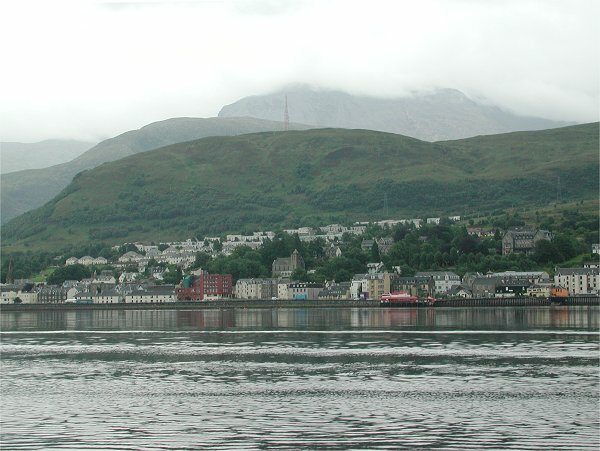 Fort William with Ben Nevis behind. 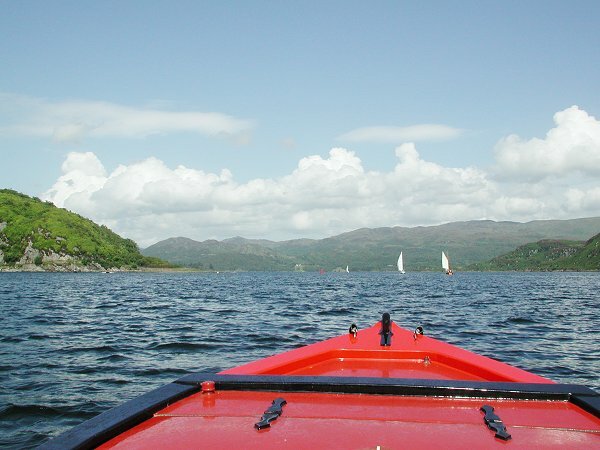 Looking back at Corran Narrows. 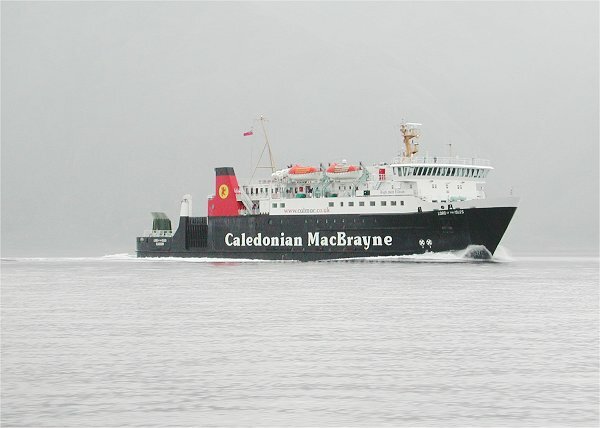 Cal-Mac Ferry on sightseeing trip. 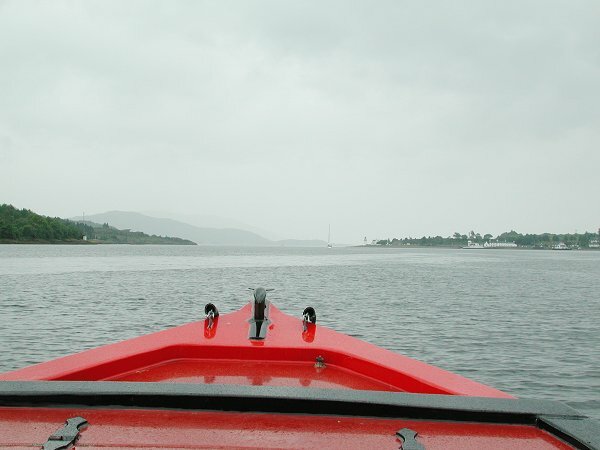 Looking back up Loch Linnhe. 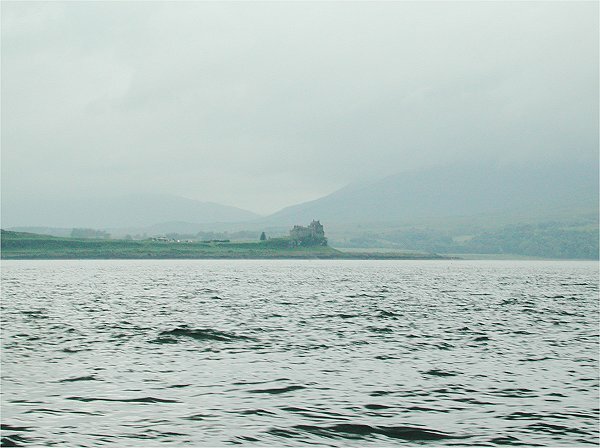 Duart Castle on the Isle of Mull. 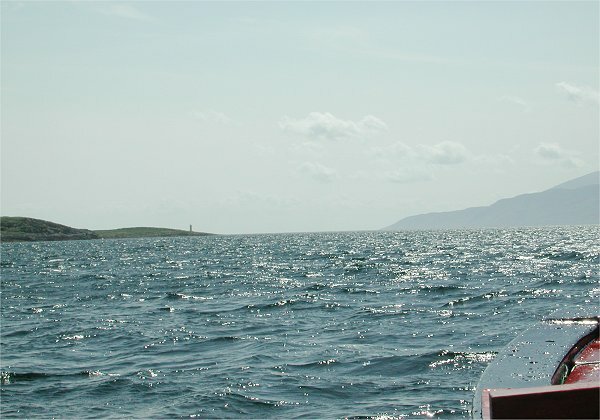 Looking between the Isle Of Lismore and Eilean Musdile towards Connel. 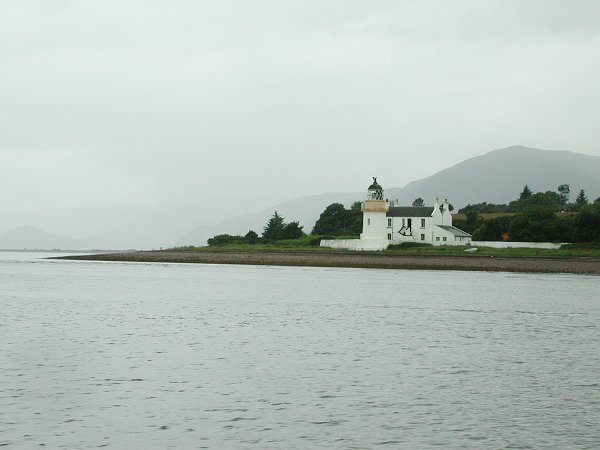 Lismore Lighthouse on the small island of Eilean Musdile, at the foot of the Isle Of Lismore. 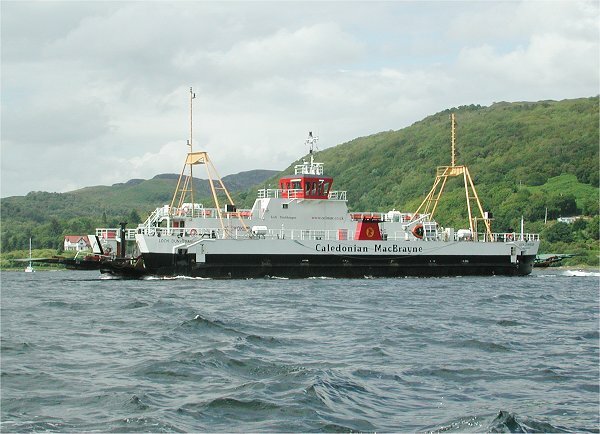 Cal-Mac Ferry from Sound of Mull to Oban. 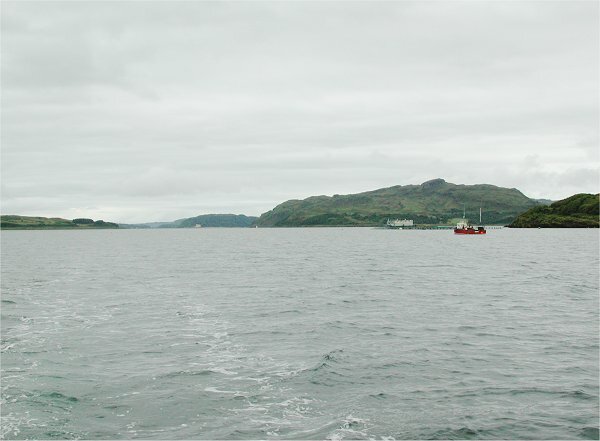 Coming into Kerrera Sound and the port of Oban. 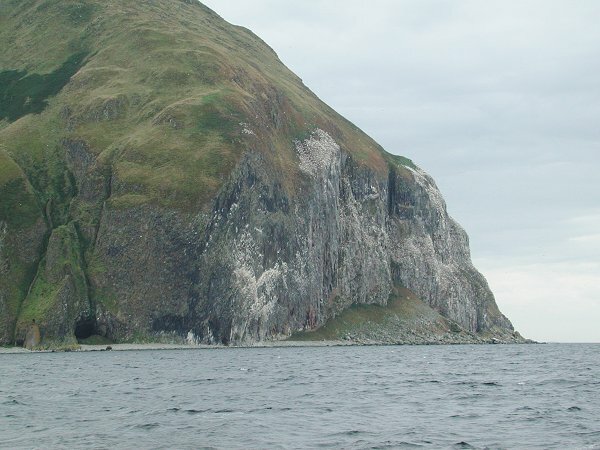 Dunollie Castle at the mouth of Kerrera Sound..
Popular yottie moorings in Ardantrive Bay on Kerrera Isle. 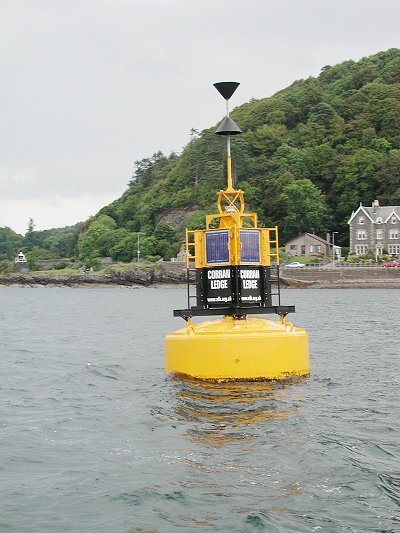 Every good buoy should have a website... look at http://www.nlb.org.uk for lots of Scottish lighthouse info. No room at the town quay in Oban. 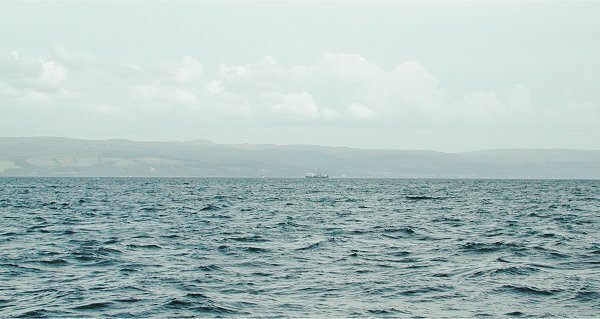 RFA Tormentor has followed us from Corpach. 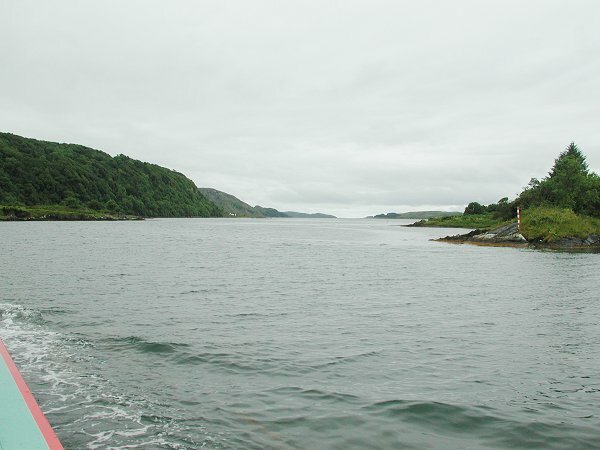 Our first view down Clachan Sound at the Clachan Bridge. 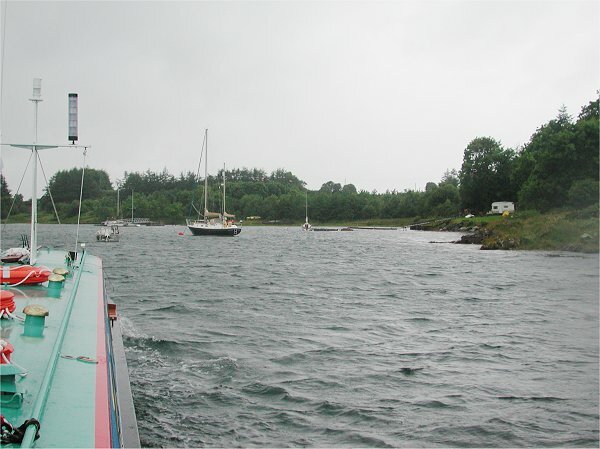 Our rain lashed anchorage in Puilladobhrain where we waited for high water so as to pass through Clachan Sound. 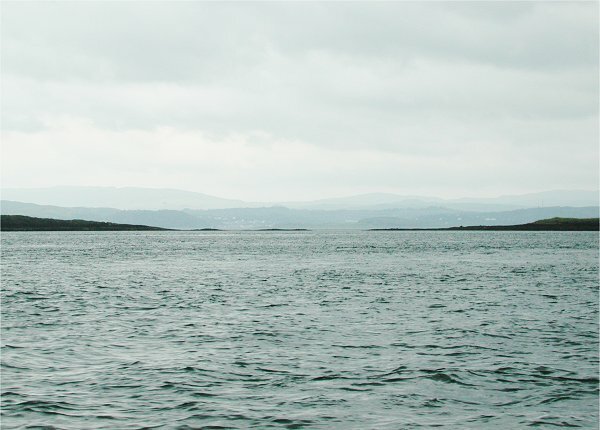 Clachan Sound. 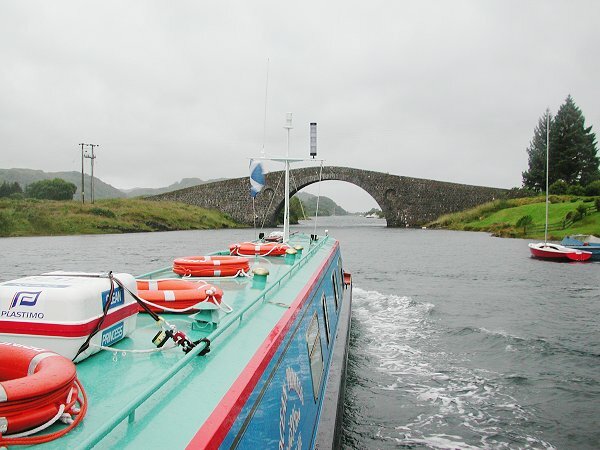 Clachan Bridge, AKA "The Bridge Over The Atlantic"
Our overnight mooring on Mick Hunter's pontoon in Clachan Sound. 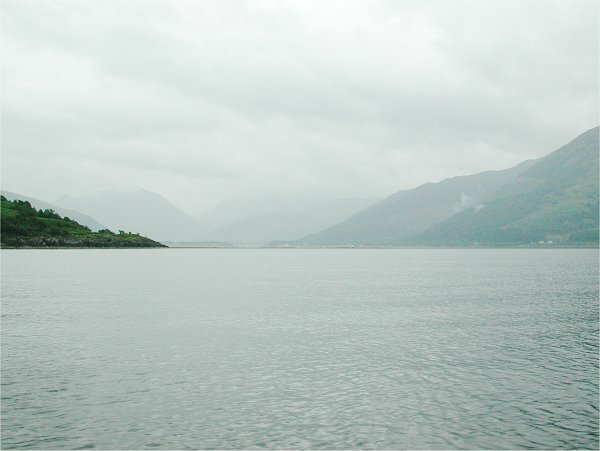 Looking back up Clachan Sound. Robbie manages a wave. 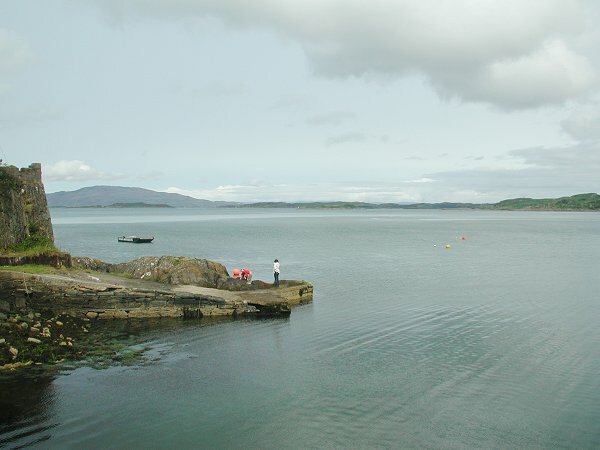 Clachan pontoon. 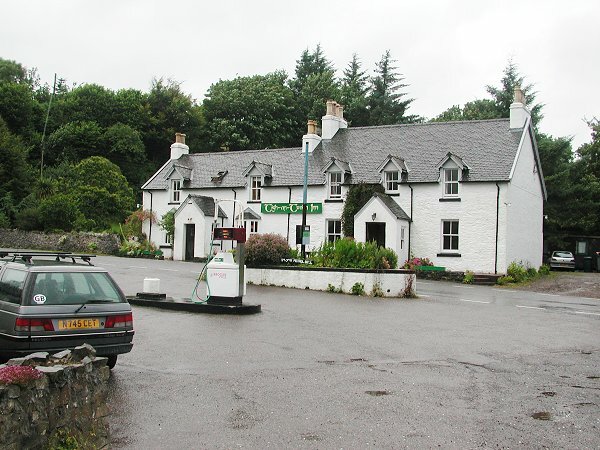 The Tigh-An-Truish pub in Clachan. 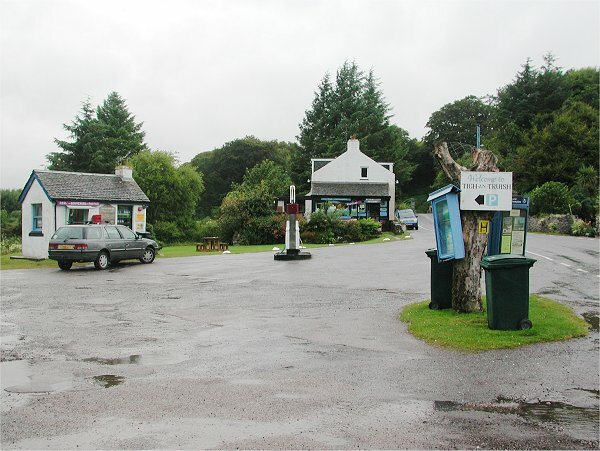 The Tigh-An-Truish petrol station and art galley. We finally dry out in the cosy Tigh-An-Truish pub. 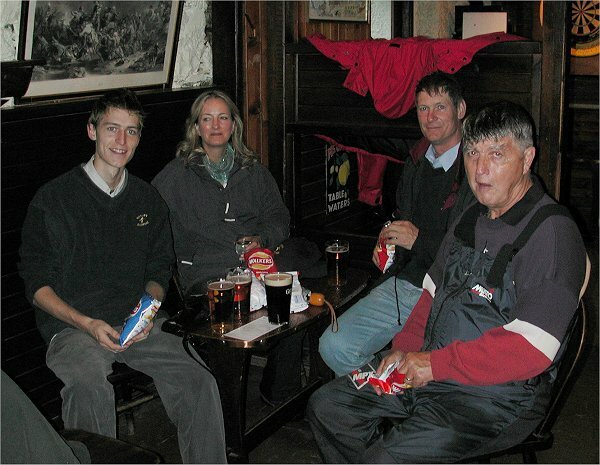 Robbie, Jane, James and John. 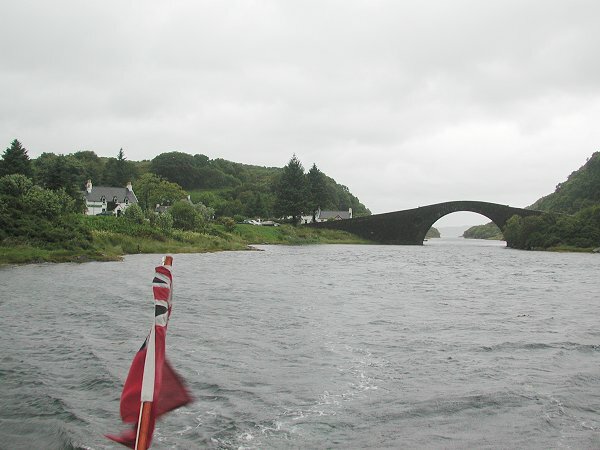 Clachan Bridge - second pass. 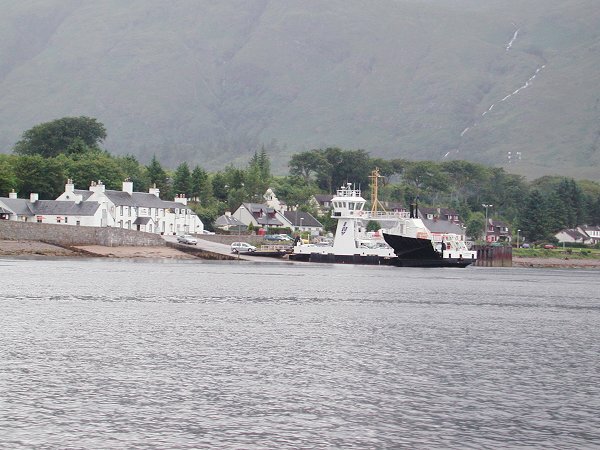 Clachan Sound - Ocean Princess at the official 70ft winding point! 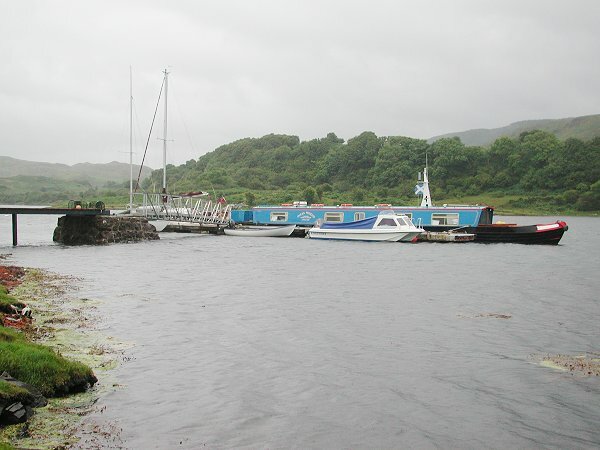 Mick Hunter's pontoon in Clachan Sound. 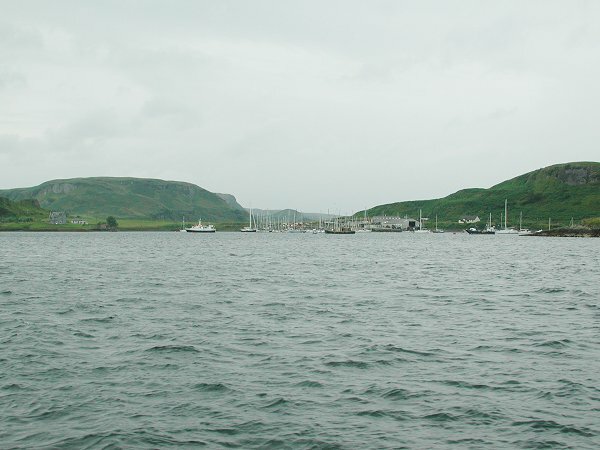 Clachan Sound gives way to Seil Sound and the little port of Balvicar. 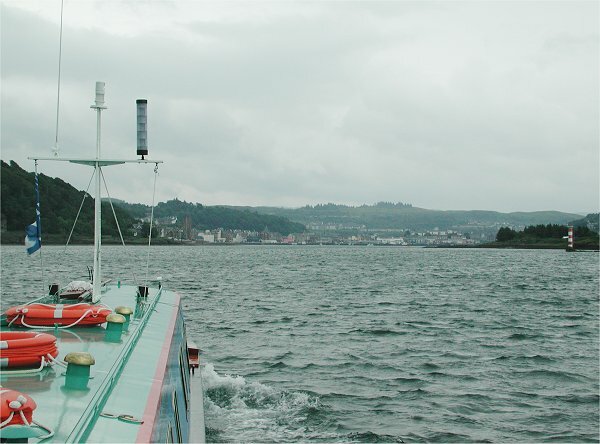 Seil Sound gives way to Shuna Sound. 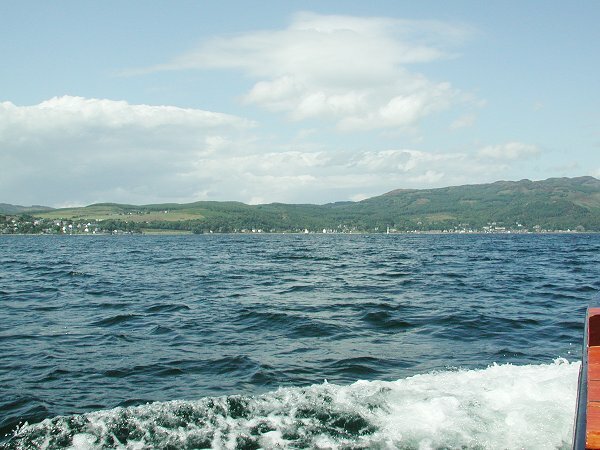 Isle of Shuna on the left, Isle of Lunig on the right. 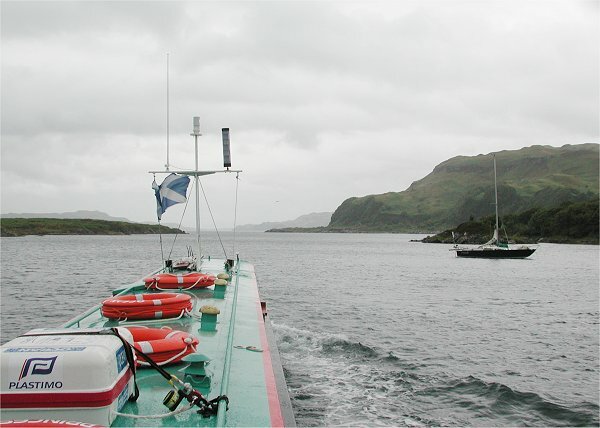 Looking back down Seil Sound. 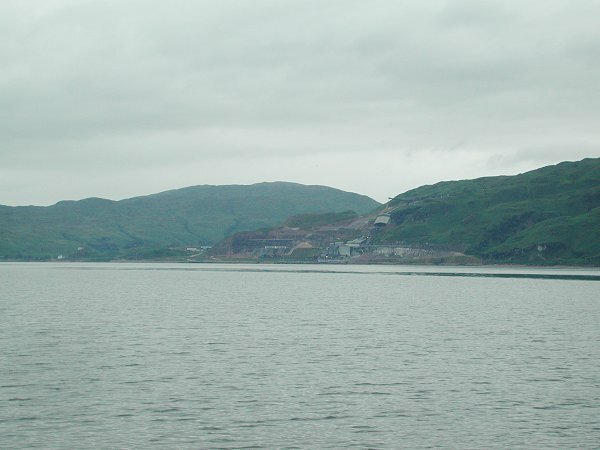 Fish farm on the right. 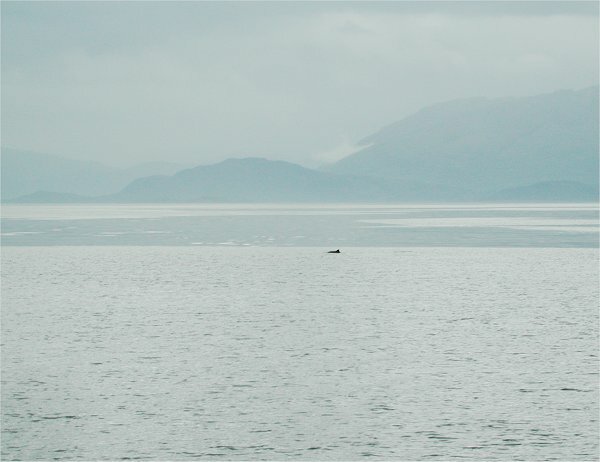 Looking across to the Gulf of Corryvreckan. 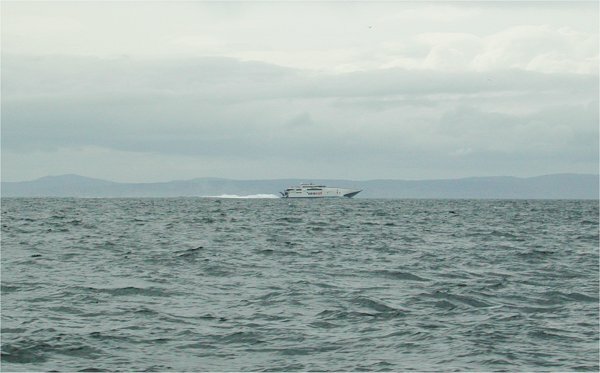 Jura on the left and Scarba on the right. 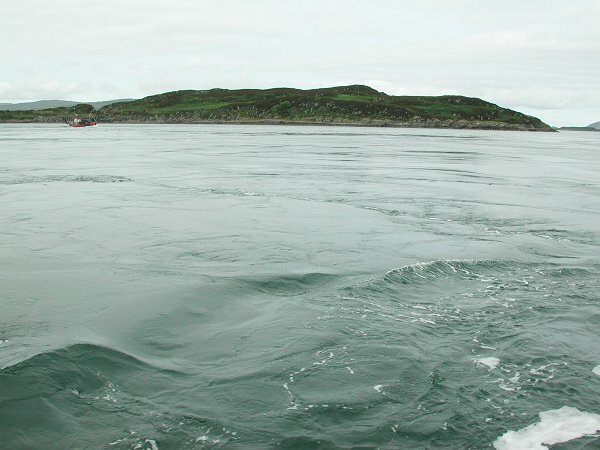 Passing round the isle of Garbh Reisa and the whirlpools of Dorus Mor. 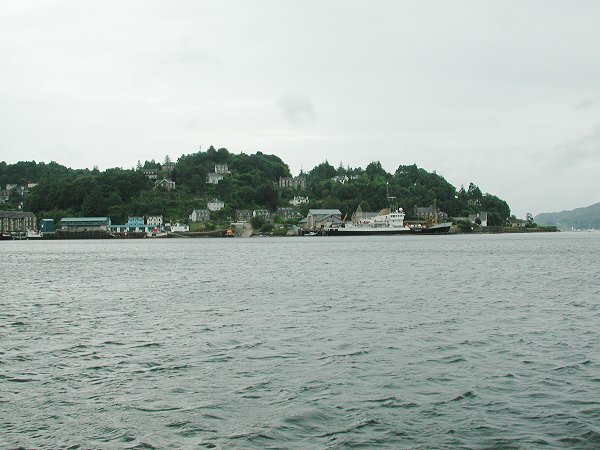 Crinan is dead centre. 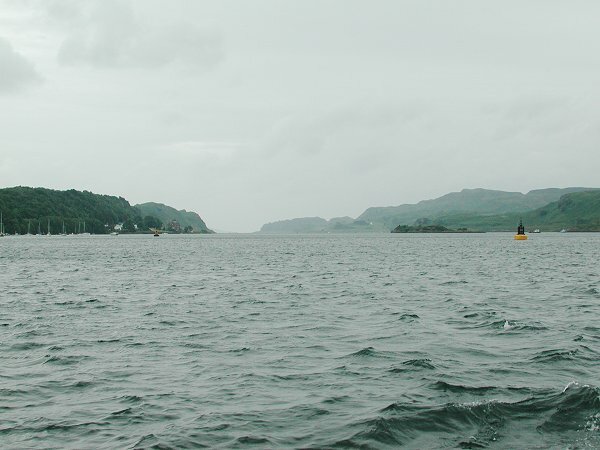 Coming into Crinan. 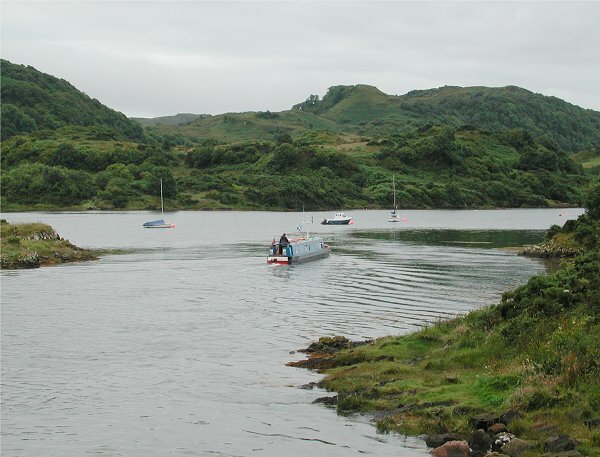 Loch Crinan. 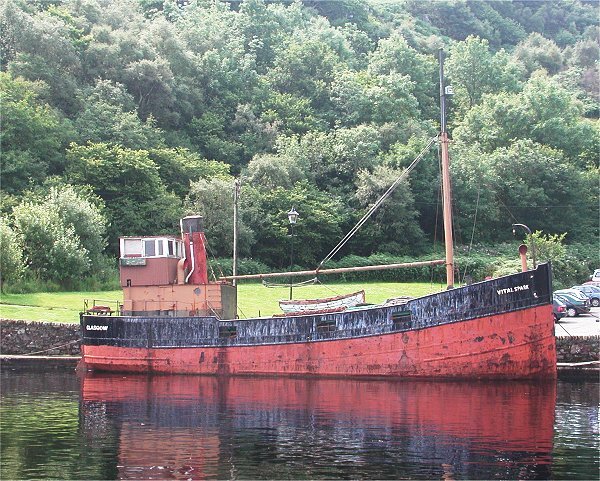 Crinan Sea Lock No 15. 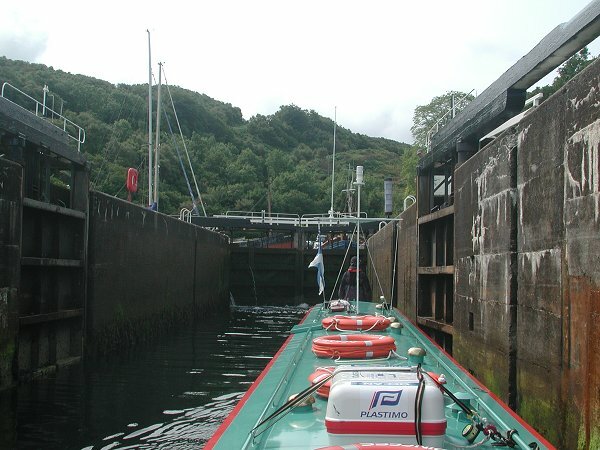 Crinan Sea Lock No 15. 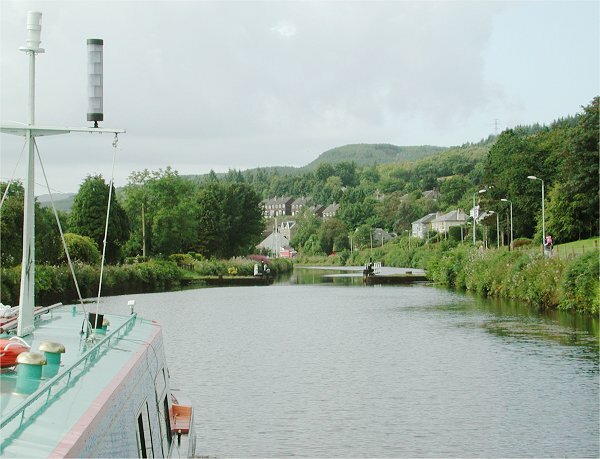 Crinan Canal. 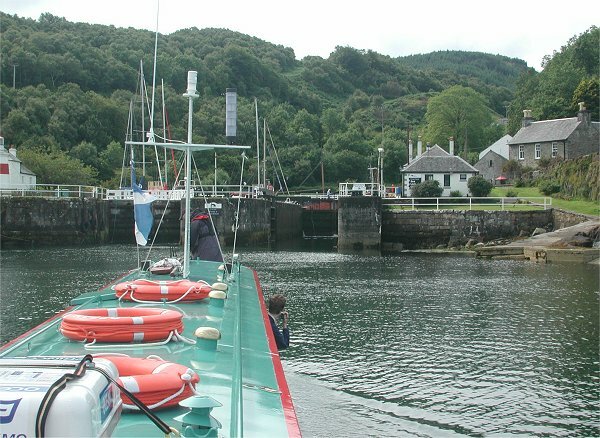 Crinan Sea Lock. 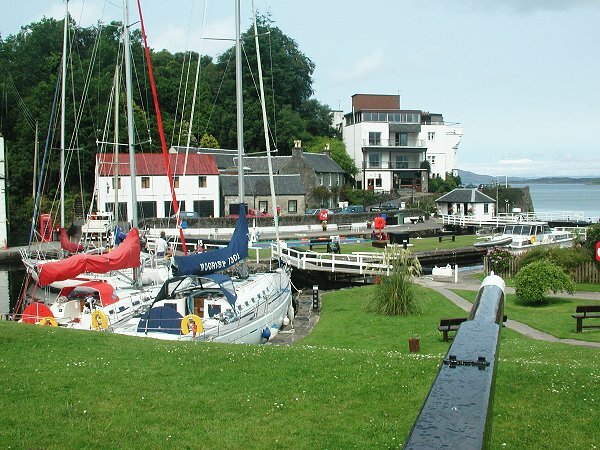 Crinan Canal. 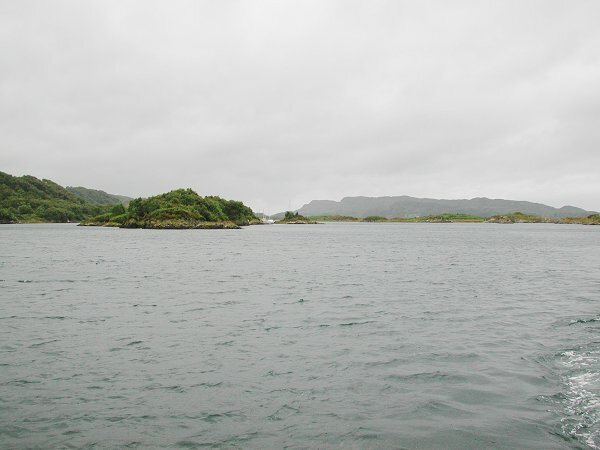 Looking out to Dorus Mor from Crinan. VIC 32 Clyde puffer. 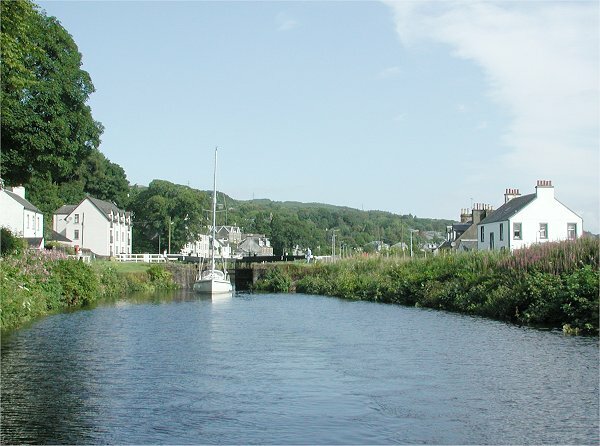 Crinan Canal. 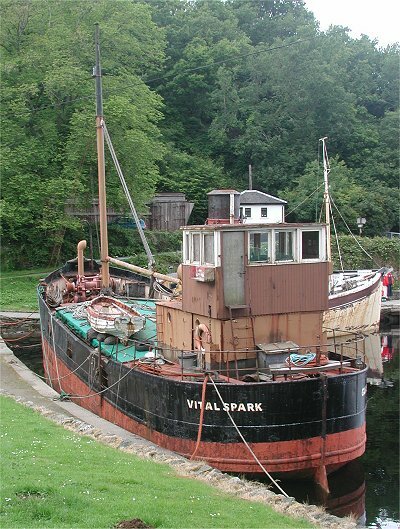 The "Vital Spark" Clyde puffer. Re-named from "Aulde Reekie" for the Para Handy TV series. 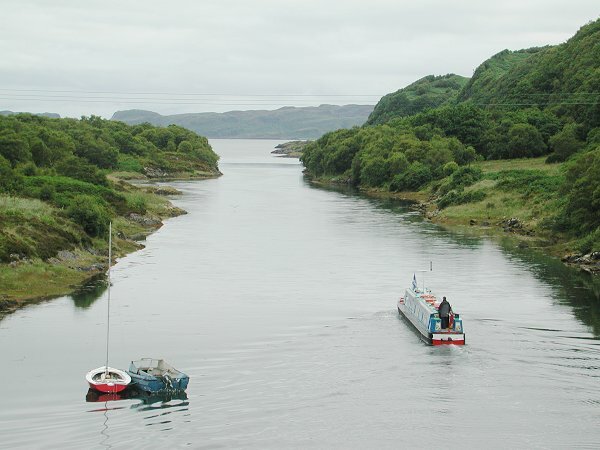 Crinan Canal. 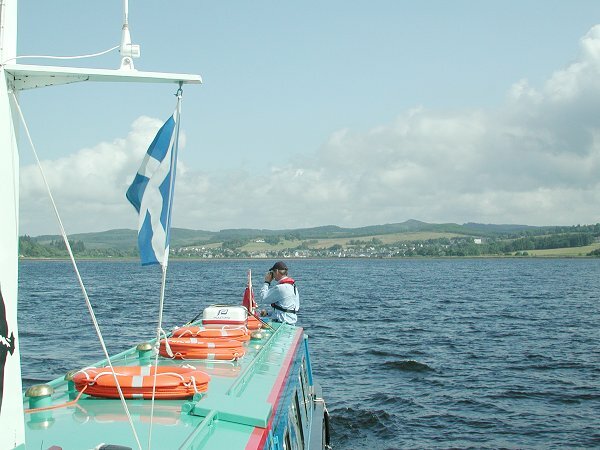 Ocean Princess on the Crinan Canal, going up Lock No 14. 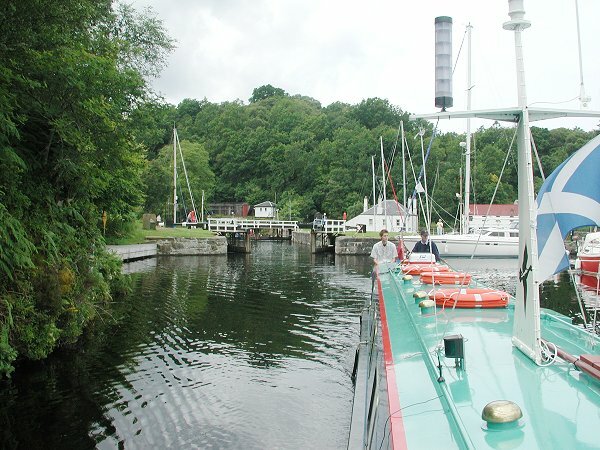 Crinan Canal. Leaving Lock No 14. 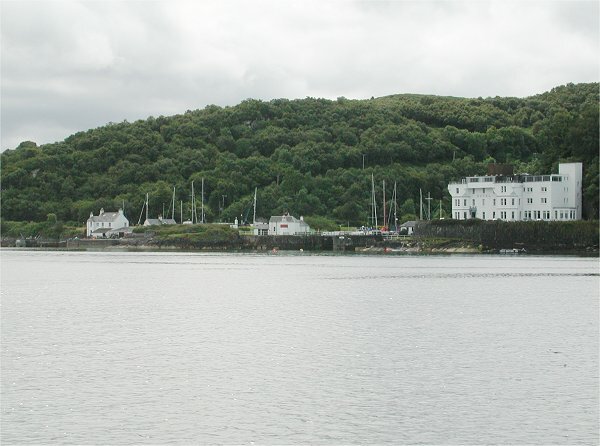 Crinan, Crinan Canal. 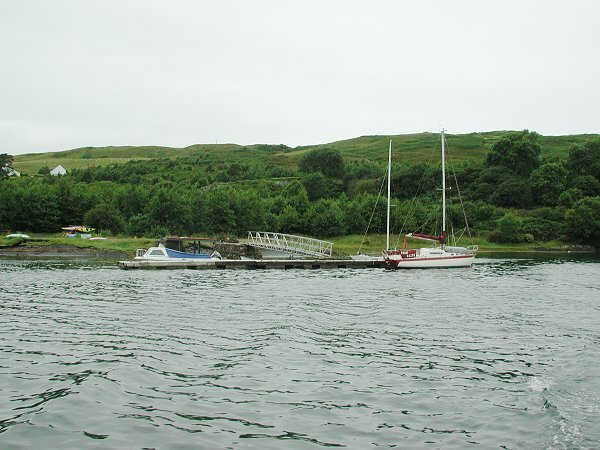 Crinan Canal. 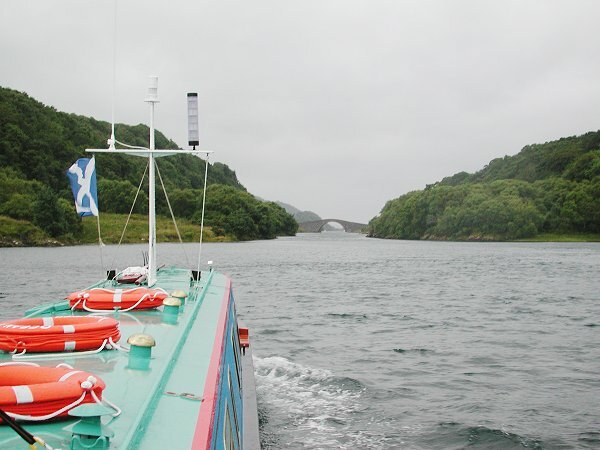 The Crinan Canal follows the River Add estuary. Ocean Princess underway steered from the front helm. 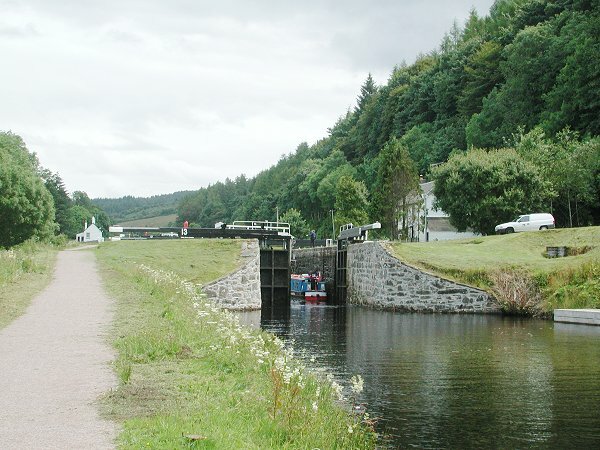 Dunardry Locks. Lock No 13. 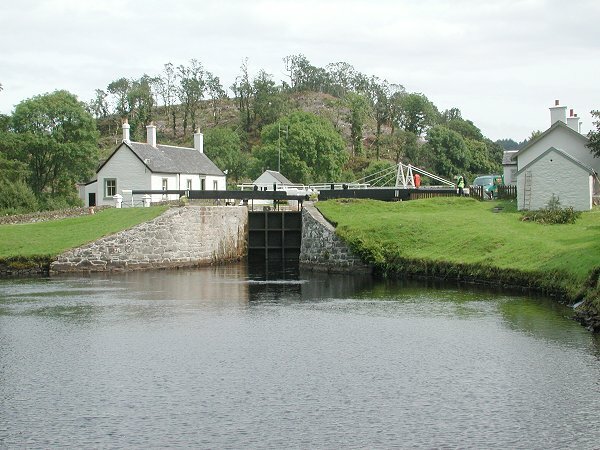 Crinan Canal. 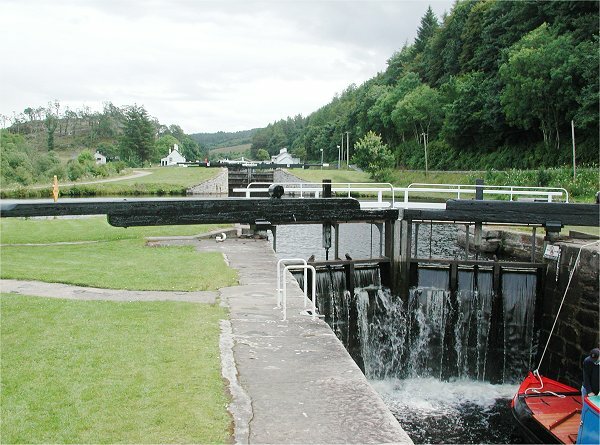 Dunardry Locks. Lock No 12. 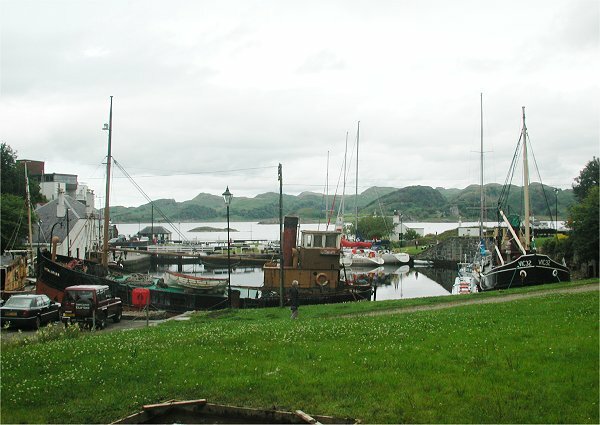 Crinan Canal. 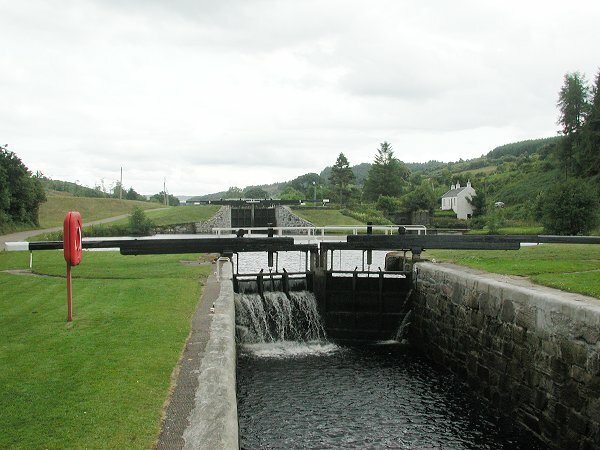 Dunardry Locks. Lock No 11. 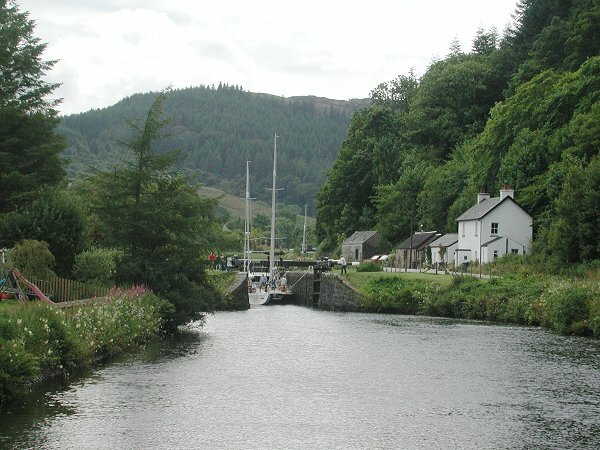 Crinan Canal. 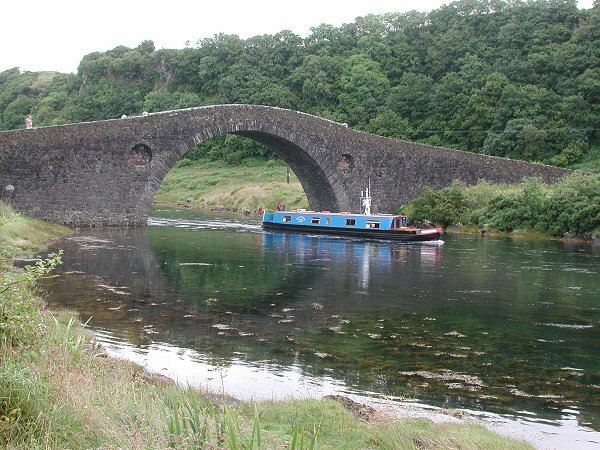 Dunardry Rolling Bridge. 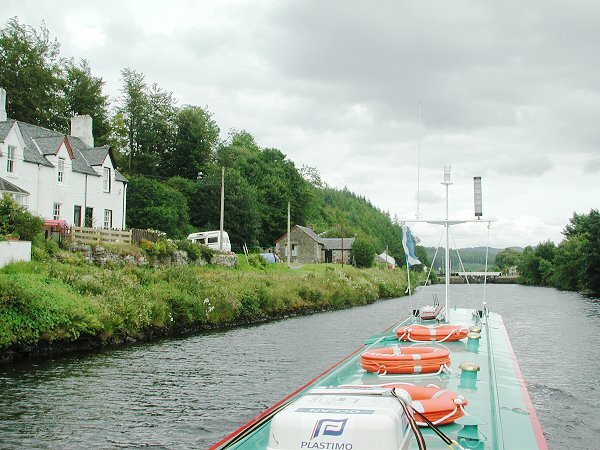 Crinan Canal. 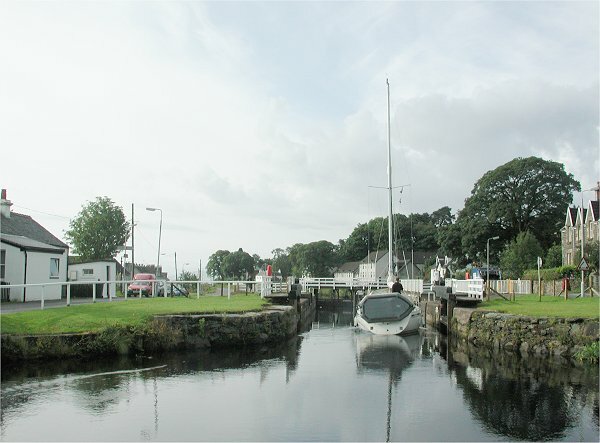 Dunardry Locks. Lock No 10. 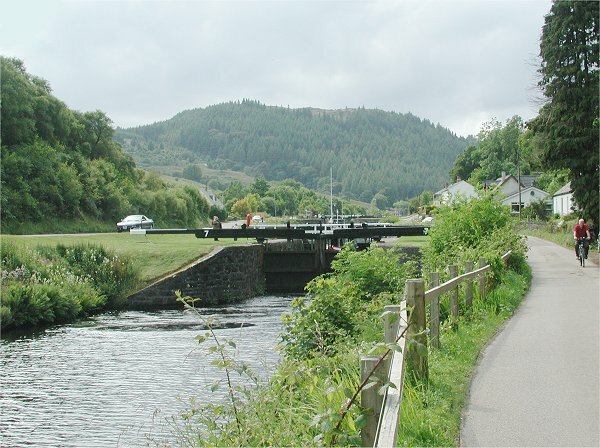 Crinan Canal. Looking back at Dunardry Lock No 11. 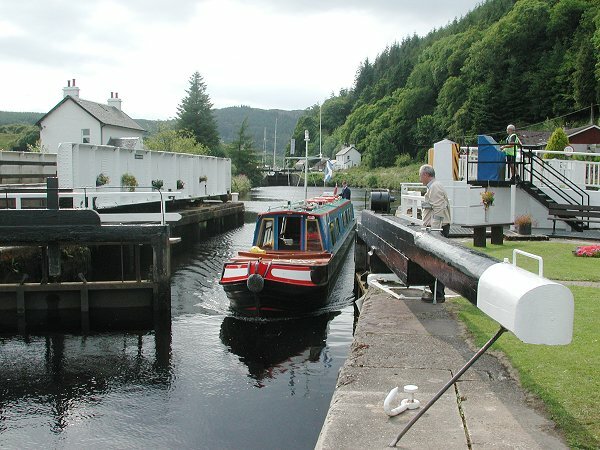 Crinan Canal. 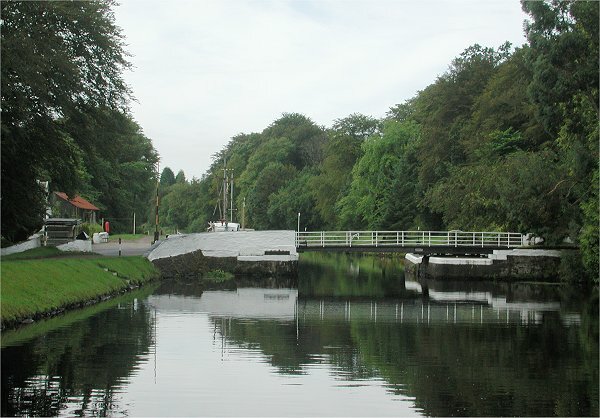 Dunardry Locks. Lock No 10 and 9. 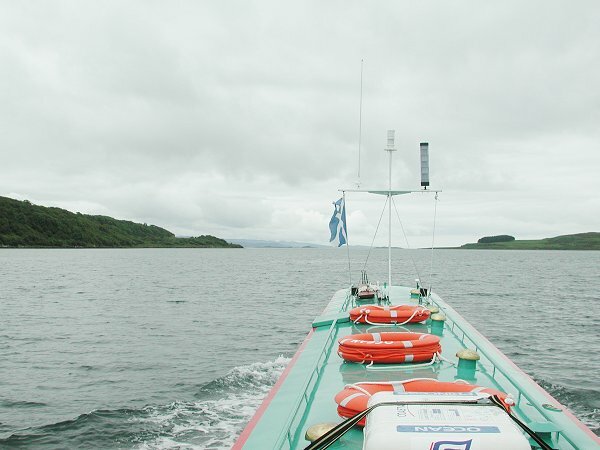 Crinan Canal. 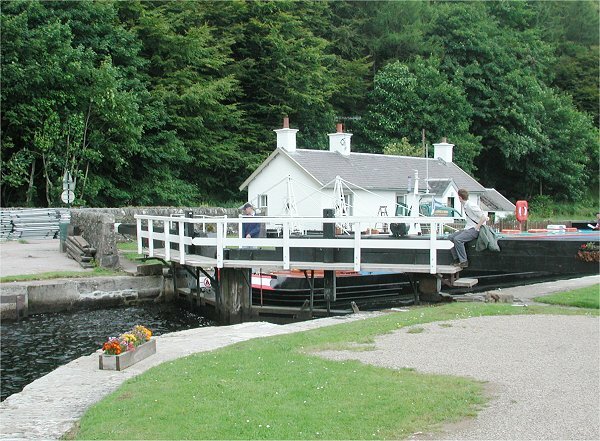 Dunardry Top Lock No 9. Just to the left is the summit pound reservoir, Loch a' Bharain. 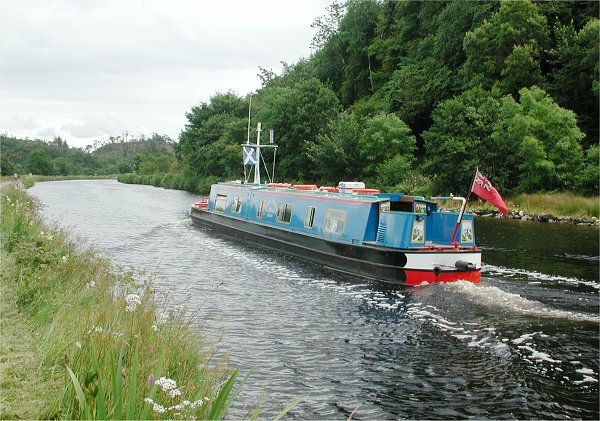 Crinan Canal. Looking back at Dunardry Lock No 10. 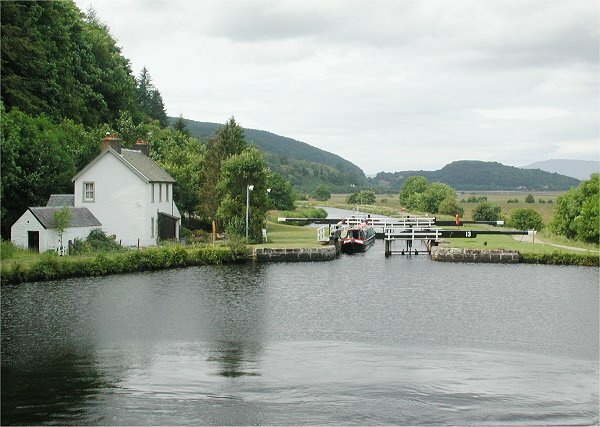 Crinan Canal. 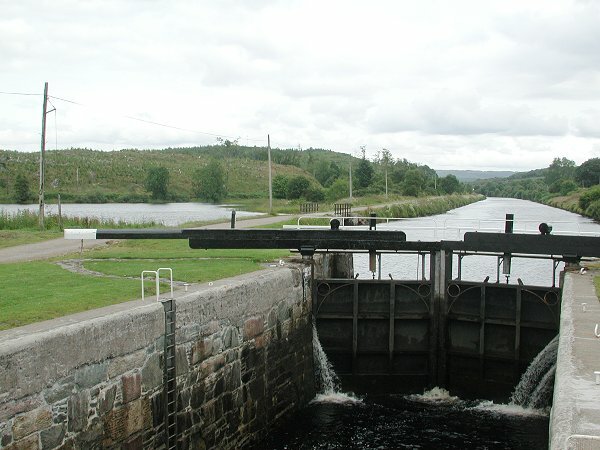 Cairnbaan Top Lock No 8. 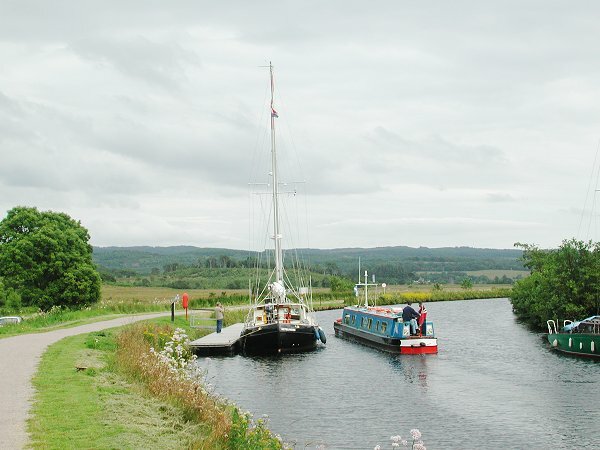 Crinan Canal. 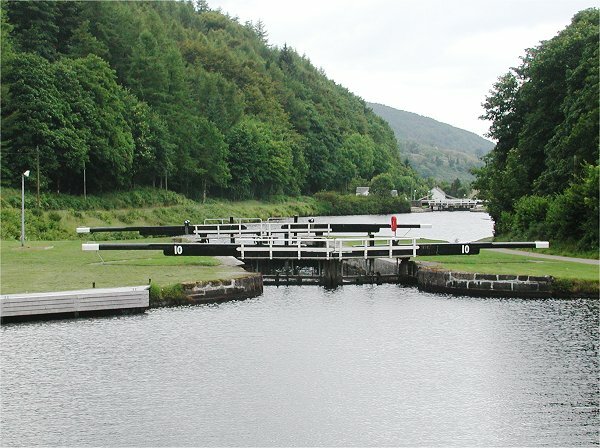 Looking along the summit pound from Cairnbaan Top Lock No 8. 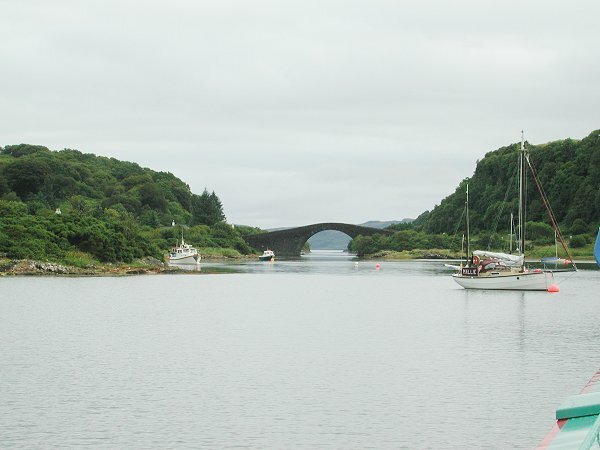 Crinan Canal. 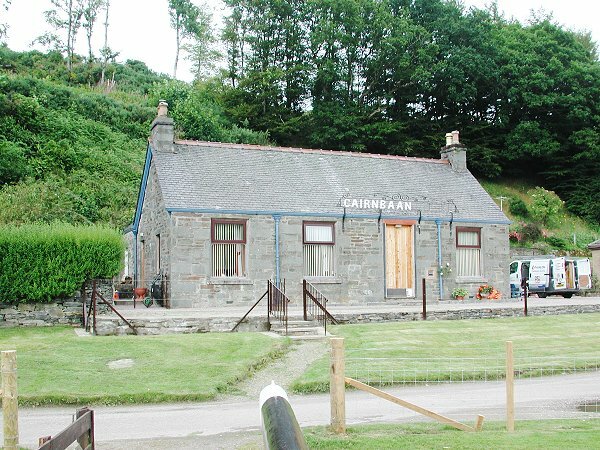 The old Cairnbaan Top Lock No 8 cottage is now a private house. 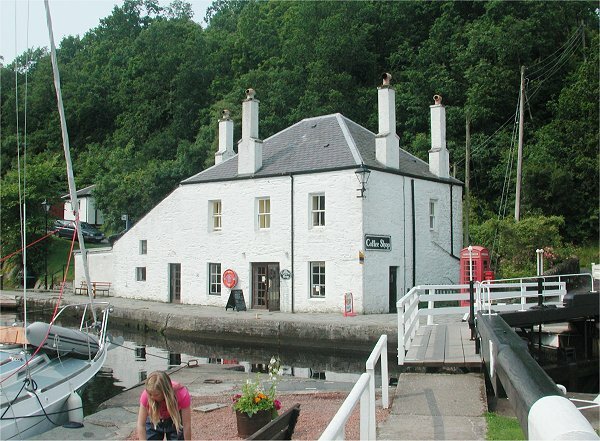 Crinan Canal. Looking down the Cairnbaan Flight to Lock No 7. 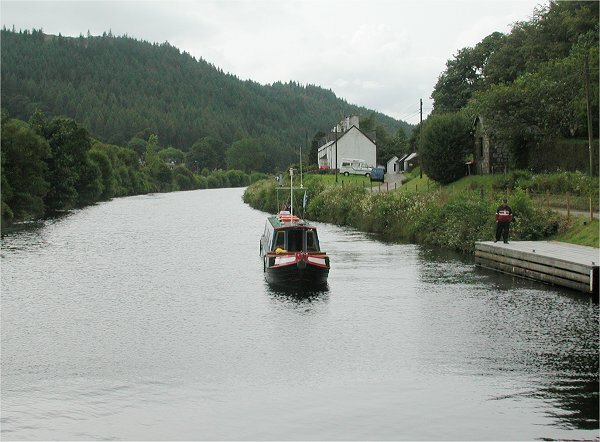 Crinan Canal. 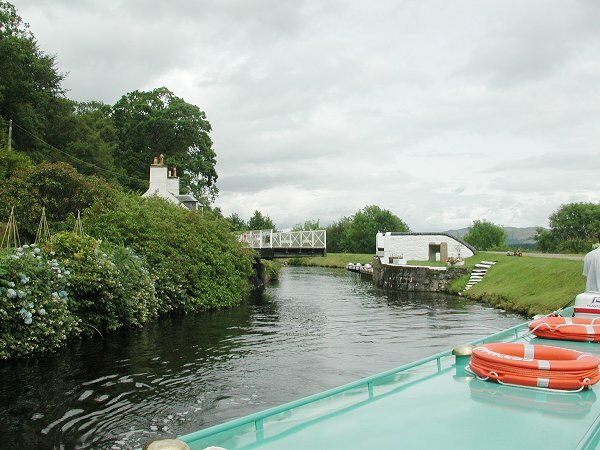 Looking back up at Cairnbaan Top Lock No 8. 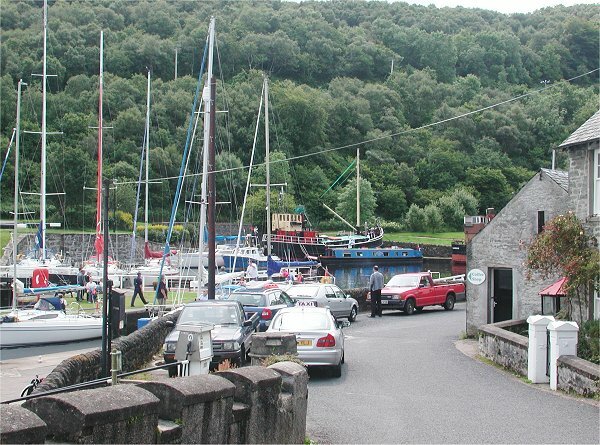 Crinan Canal. 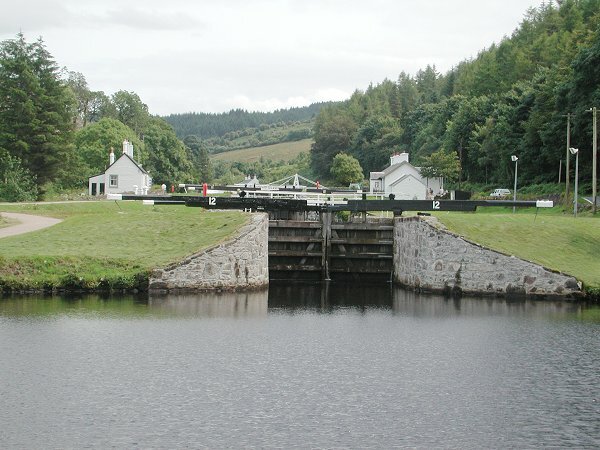 Cairnbaan Lock No 7. 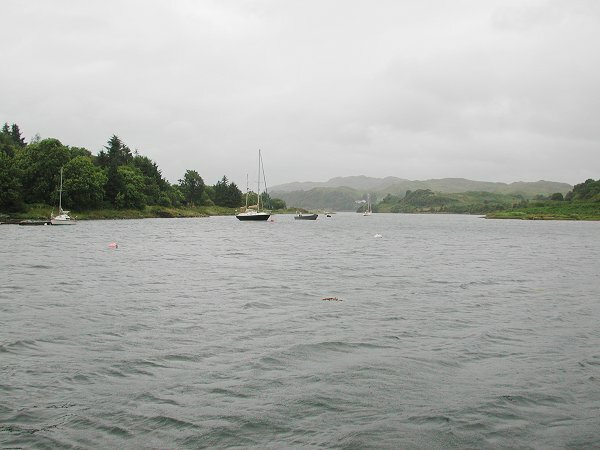 Crinan Canal. 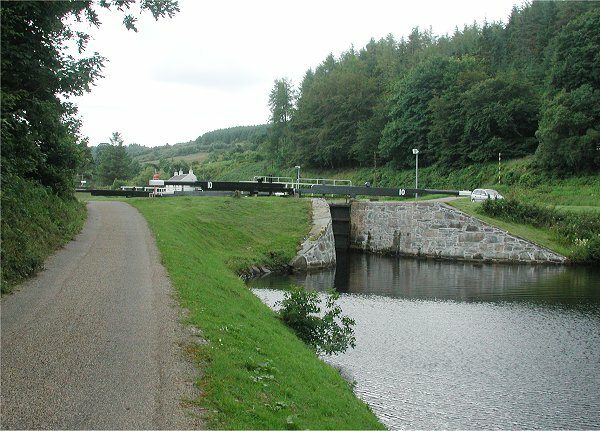 Cairnbaan Lock No 6. 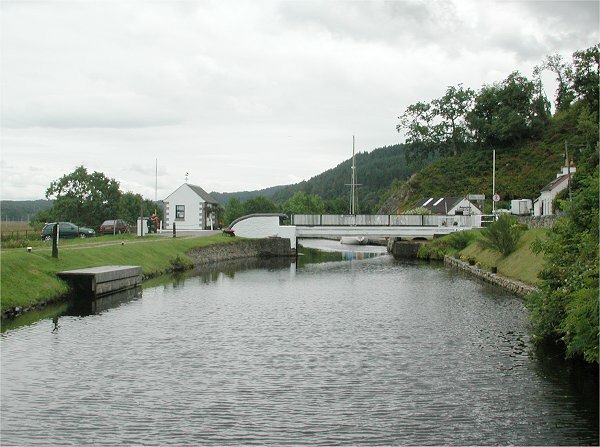 Crinan Canal. 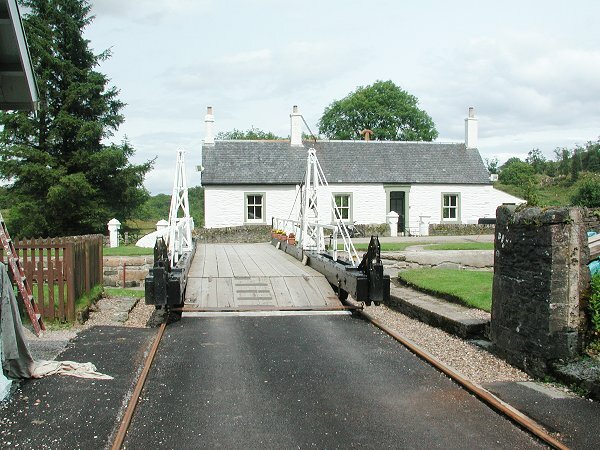 Cairnbaan Bottom Lock No 5 and Swingbridge. 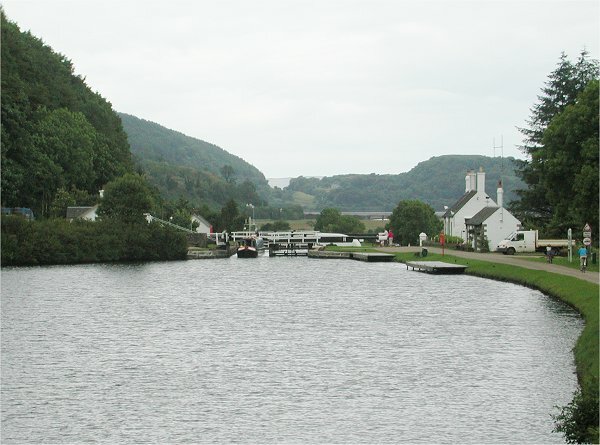 Crinan Canal. 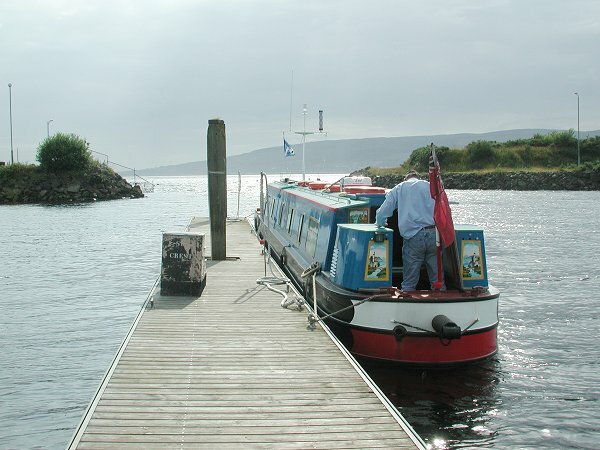 Just room for Ocean Princess on the pontoon below Cairnbaan Bottom Lock No 5. 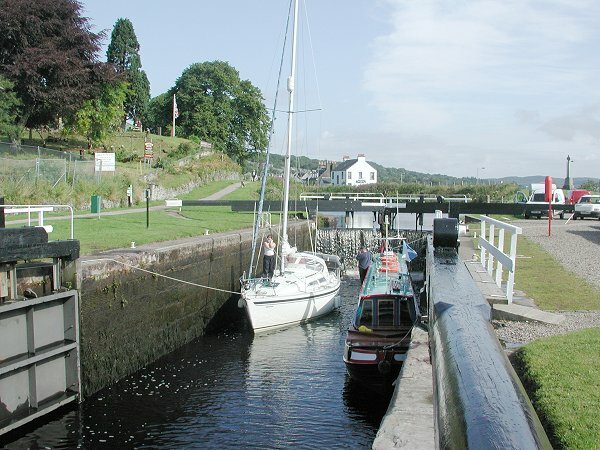 Crinan Canal. 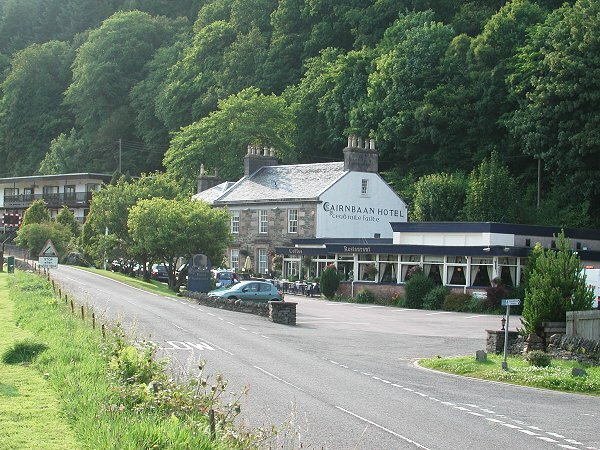 The Cairnbaan Hotel. 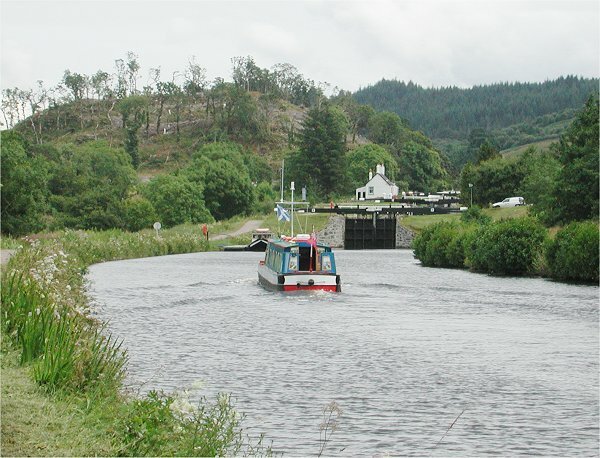 Crinan Canal. 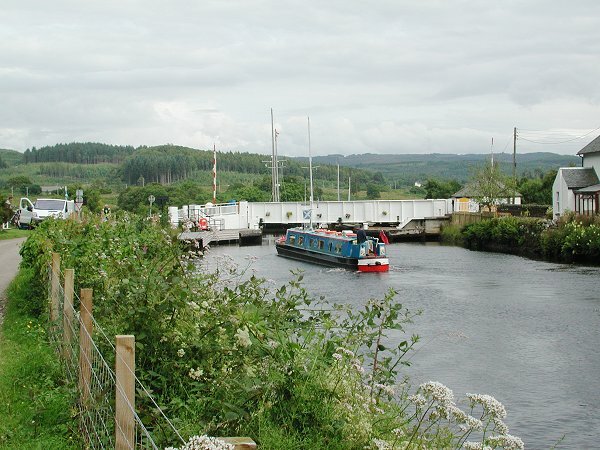 Oakfield Swingbridge at Lochgilphead. 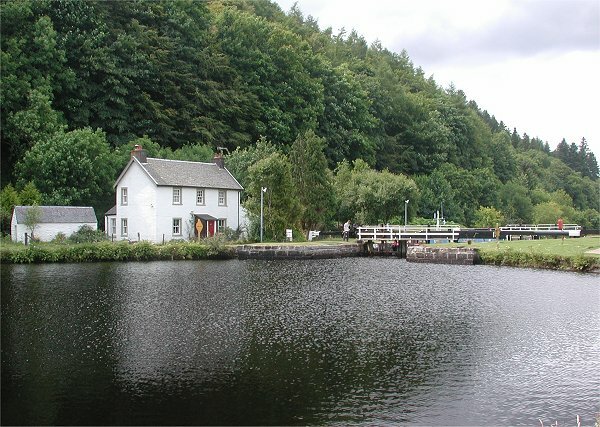 Crinan Canal. 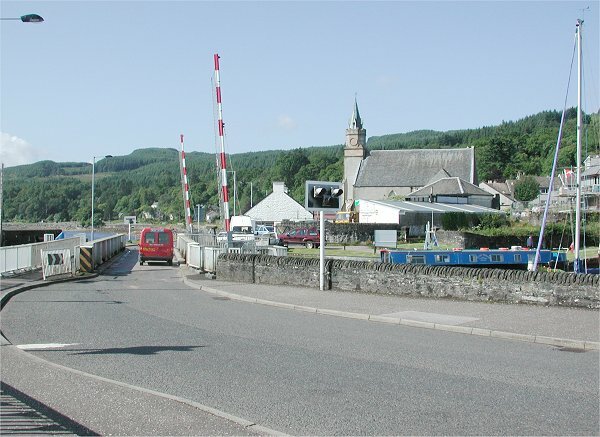 Kilduskland Stop Gates. 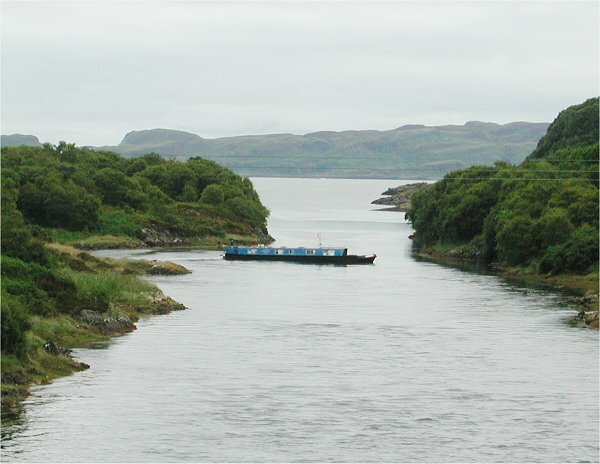 Crinan Canal. 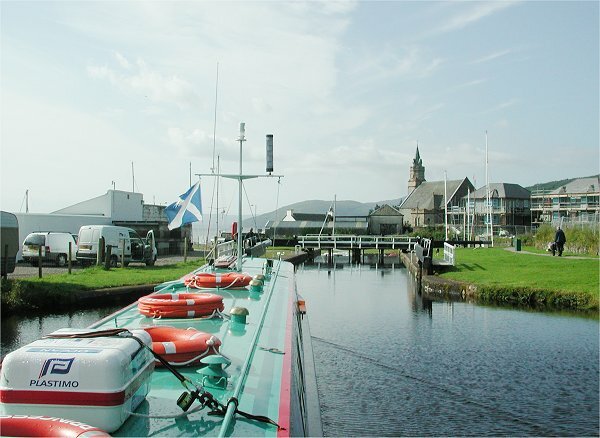 Ardrishaig Lock No 4, with swingbridge over the chamber. 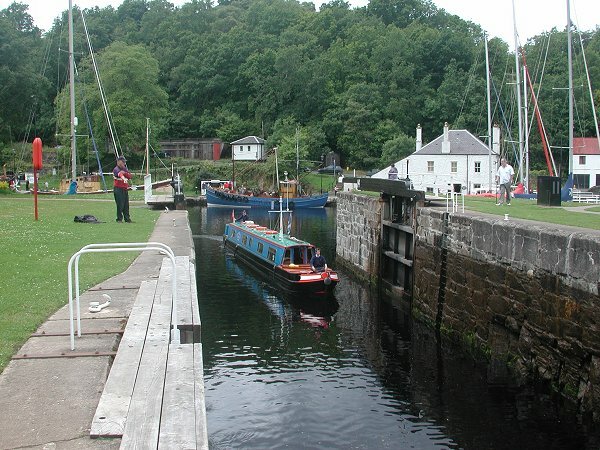 Crinan Canal. 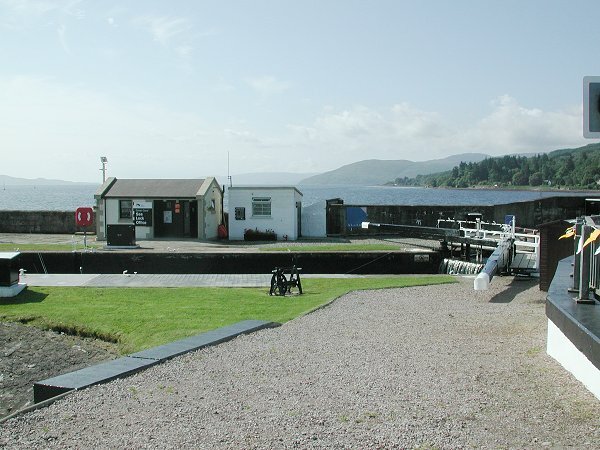 Ardrishaig Lock No 4. 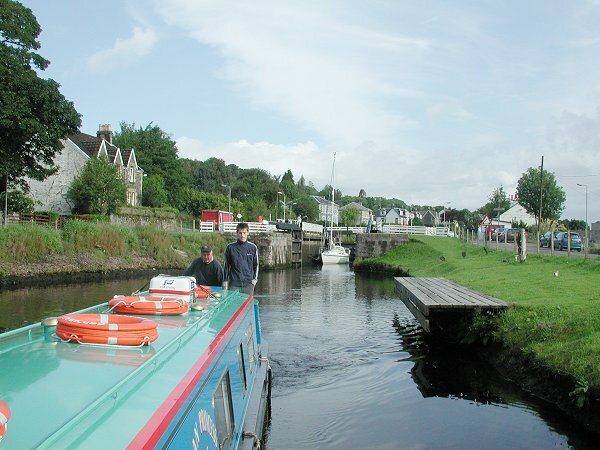 Crinan Canal. 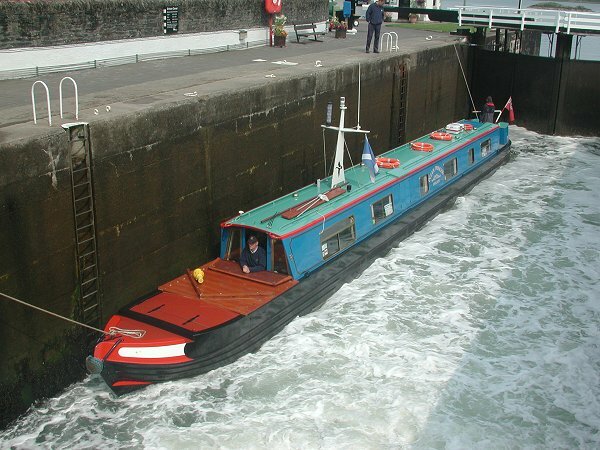 Ardrishaig Lock No 3. 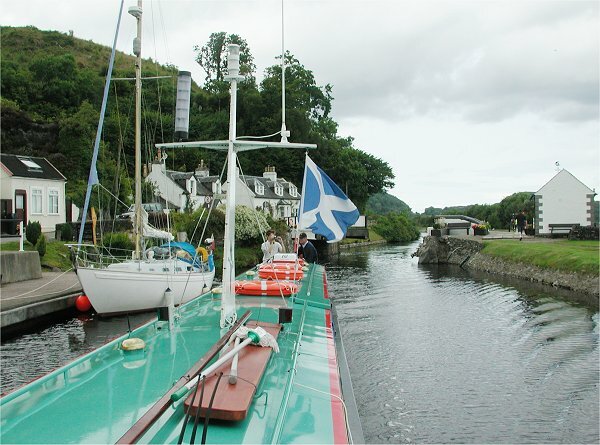 Crinan Canal. 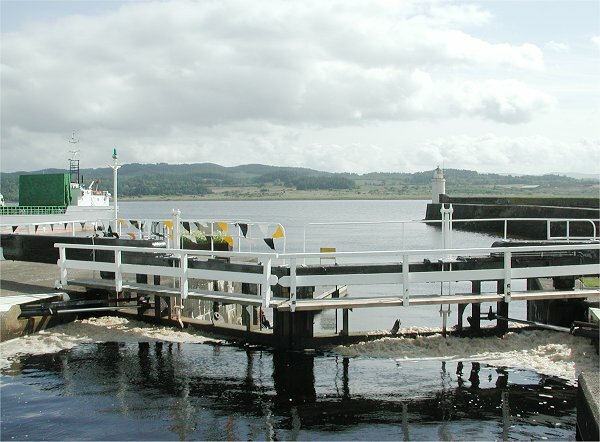 Ardrishaig Lock No 2. 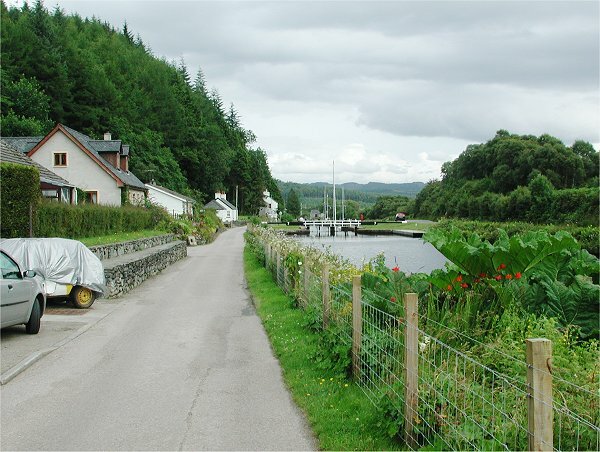 Crinan Canal. 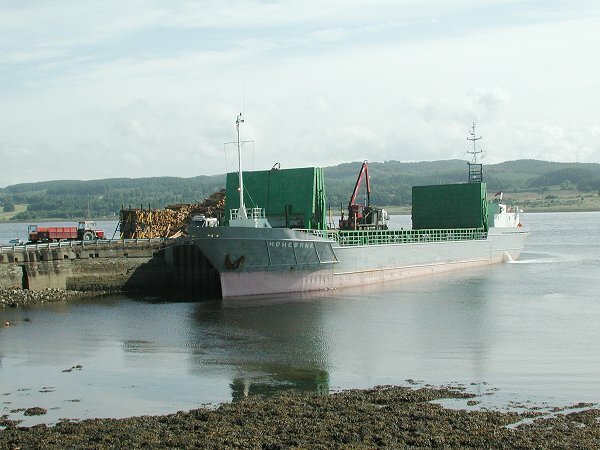 Ardrishaig Sea Lock No 1 from the breakwater. 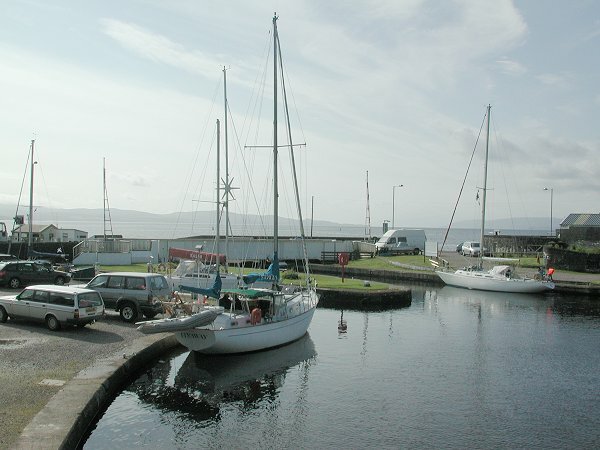 Small coasters can berth at Ardrishaig Wharf. 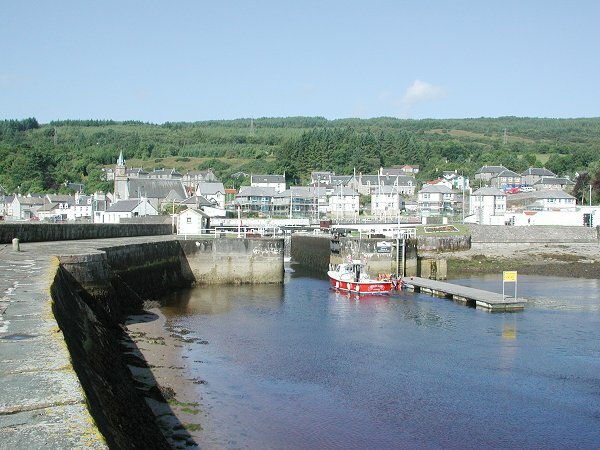 Ardrishaig Sea Lock No 1. 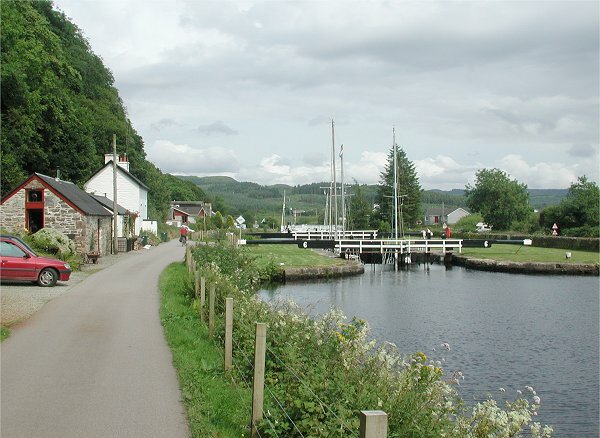 Crinan Canal. Ardrishaig Swingbridge. The garage beyond does marine diesel. 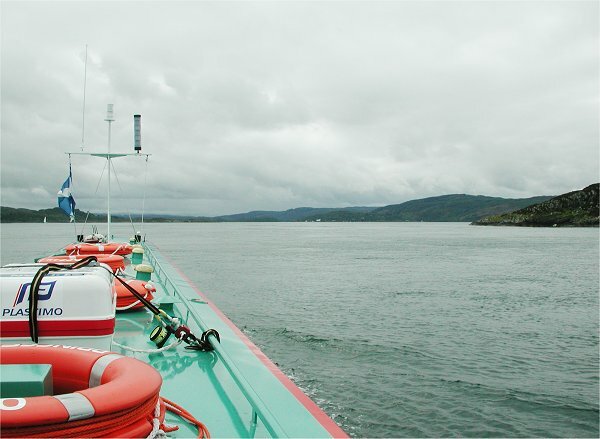 Looking out from Ardrishaig Sea Lock No 1. 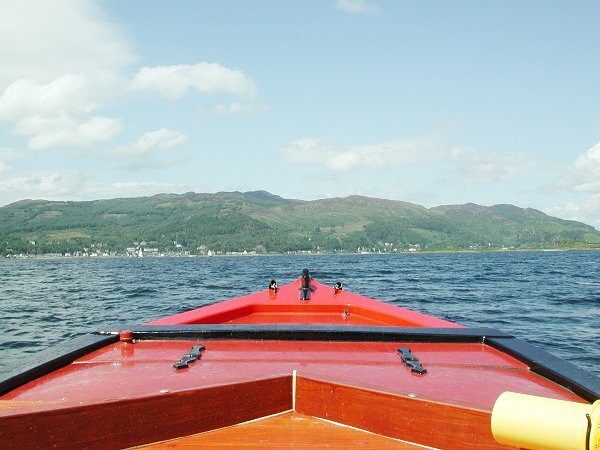 Looking back up Loch Gilp at Lochgilphead. 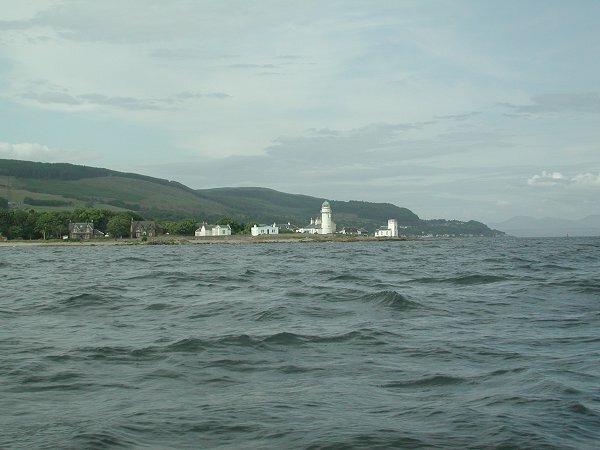 Ardlamont Point, the end of Loch Fyne and the start of The Sound Of Bute. 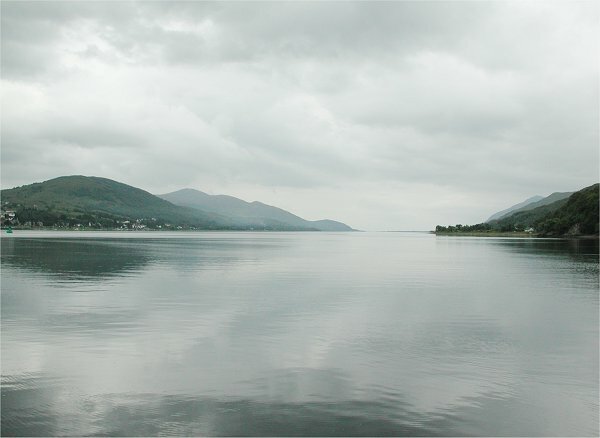 Kames and Auchenlochan. 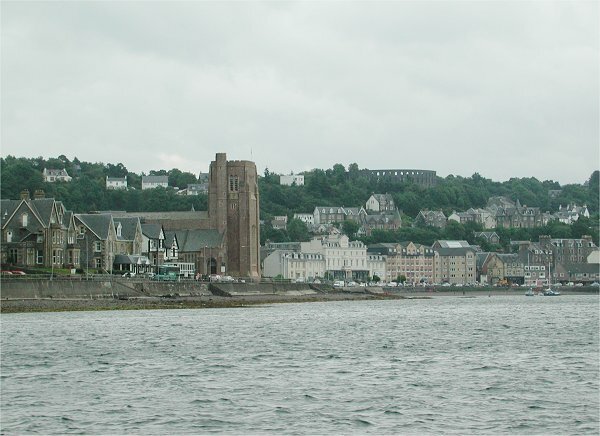 Kyles of Bute. 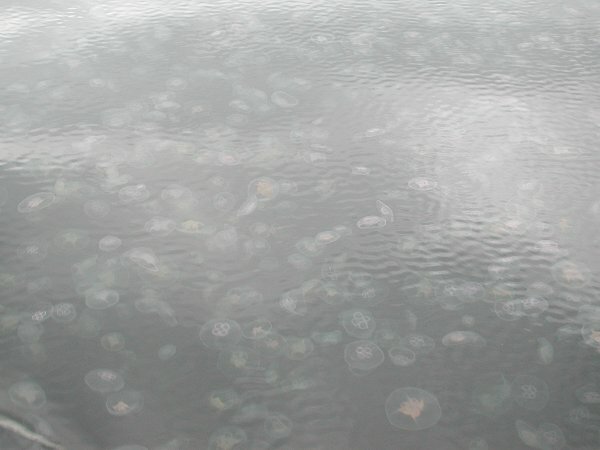 The Burnt Islands. 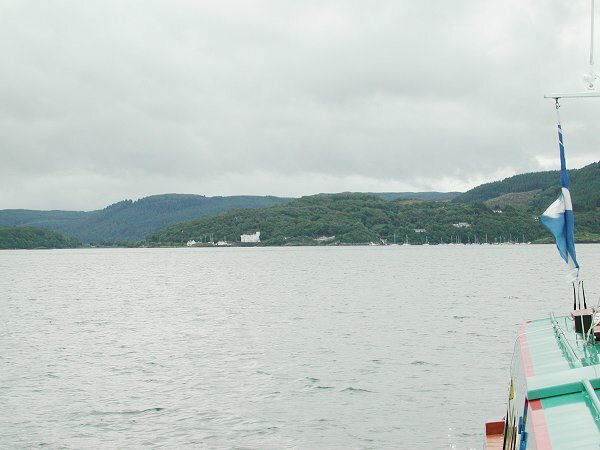 Kyles Of Bute. 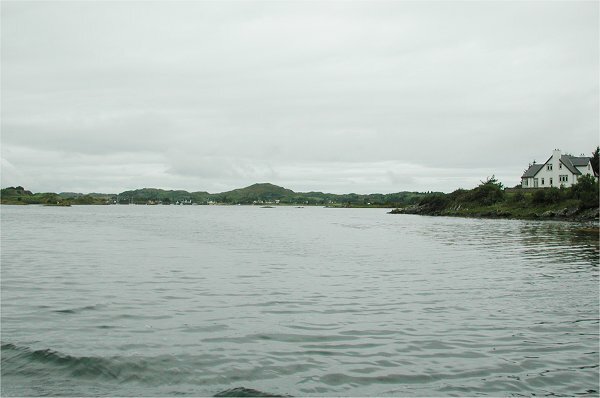 Tight Channel through the Burnt Islands. 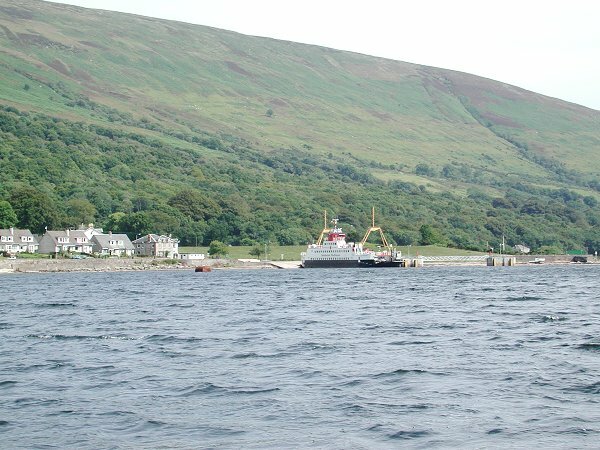 Colintravie Ferry. 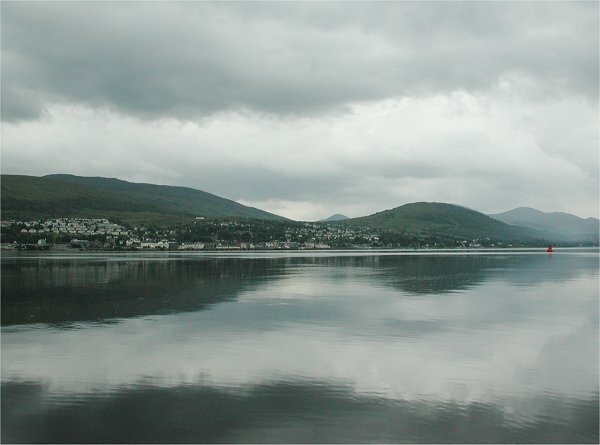 Kyles Of Bute. 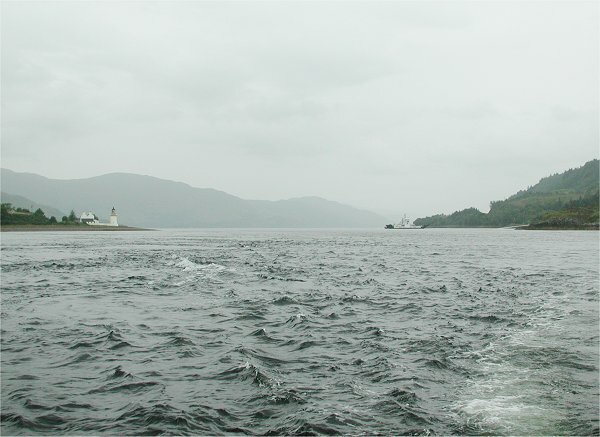 Heading out of The Kyles Of Bute. Toward Point in the distance. 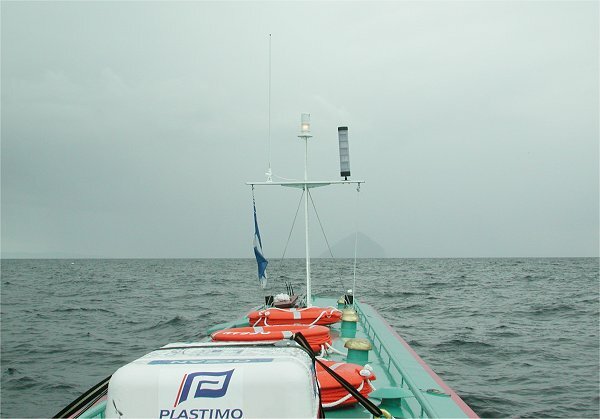 Toward Point. 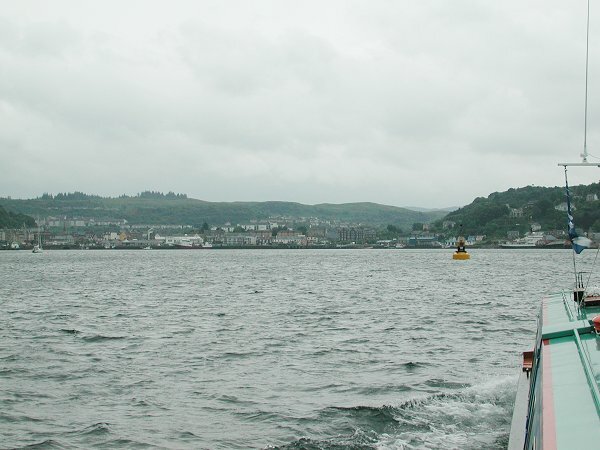 We now cross the Firth of Clyde to Inverkip. 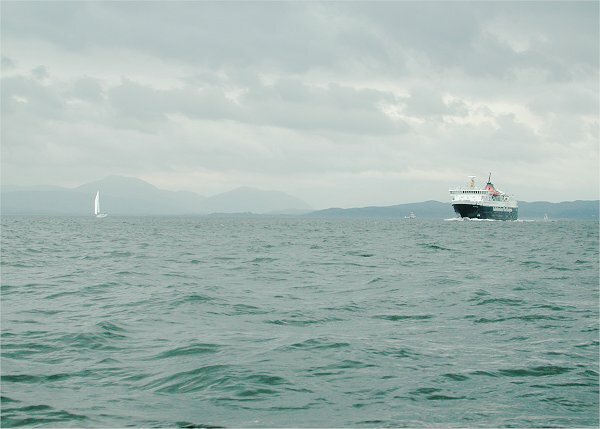 Inverkip in the distance. 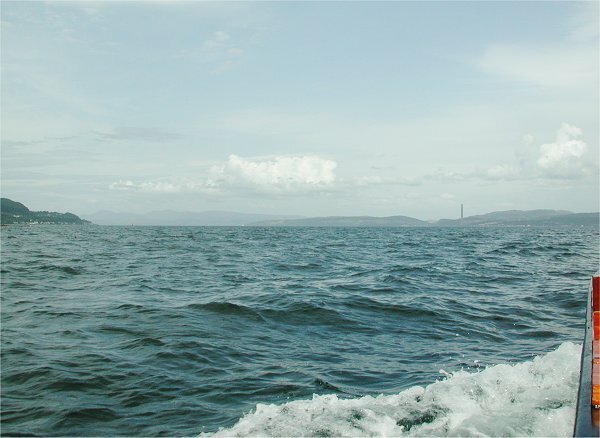 Firth Of Clyde. 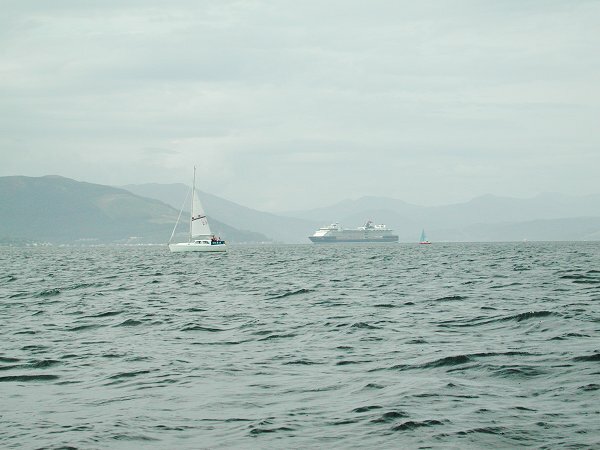 Celebrity cruise ship Constellation out in the Firth Of Clyde. 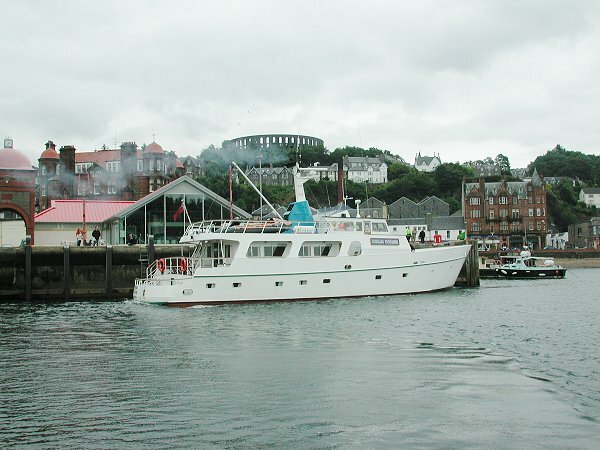 Ocean Princess gets pole position in Inverkip Marina. 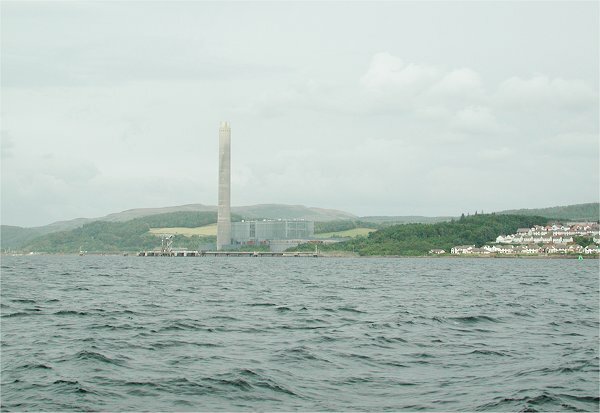 Hunterston Quay coal berth. 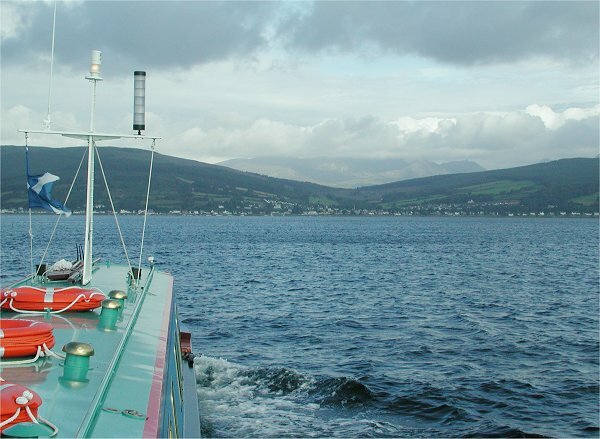 Fairlie Roads, on the inside of the Cumbrae Islands. 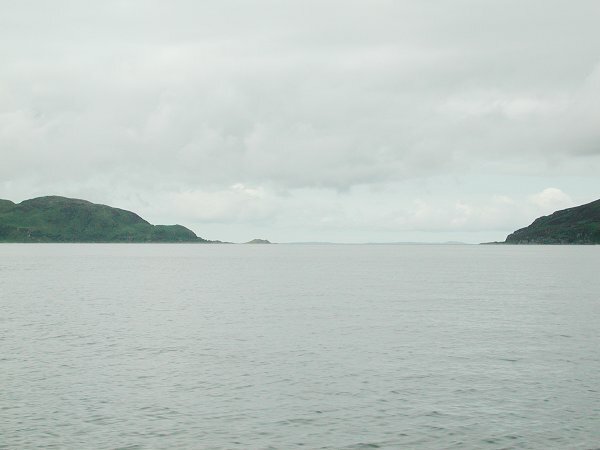 Coming into Lamlash Bay, Arran to the left and Holy Island to the right. 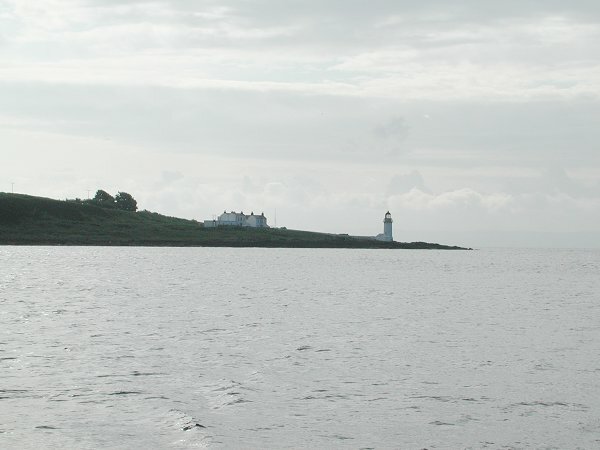 Lighthouse at the tip of Holy Island. 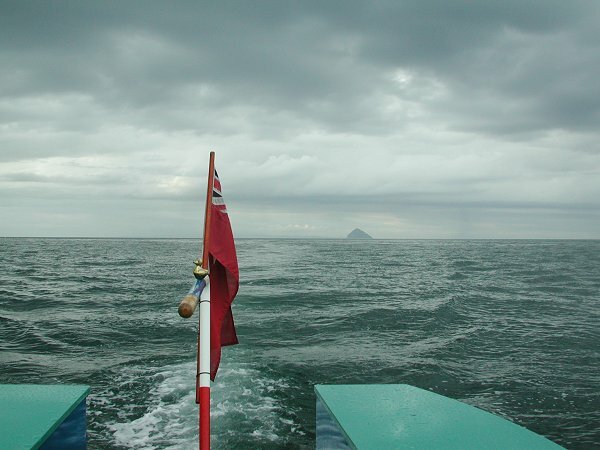 Ailsa Craig looms into view. 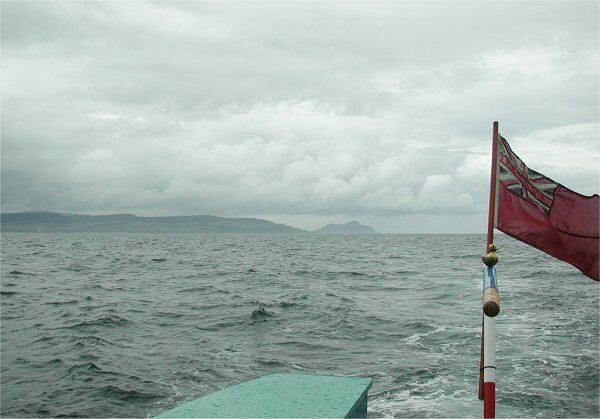 Looking across to the Mull of Kintyre and Sanda Island. 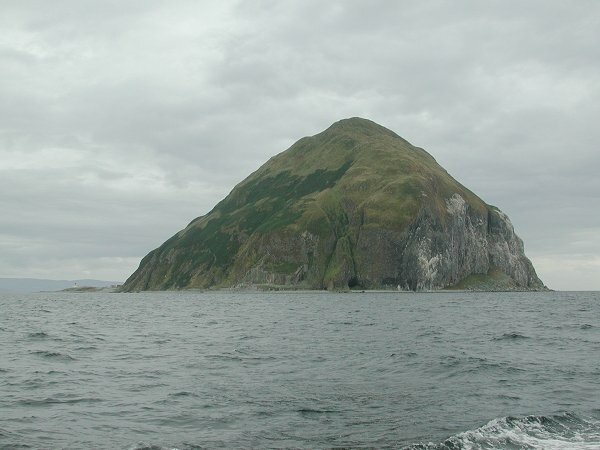 Ailsa Craig. Lighthouse on Foreland Point. 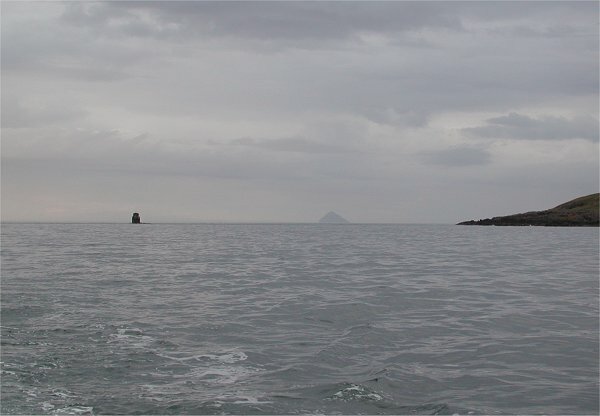 Looking back at Ailsa Craig. Corsewall Point. Rhins Of Galloway. 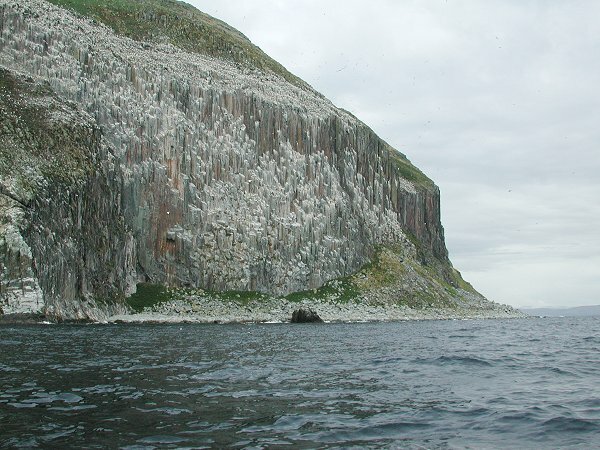 Last look back at Ailsa Craig. 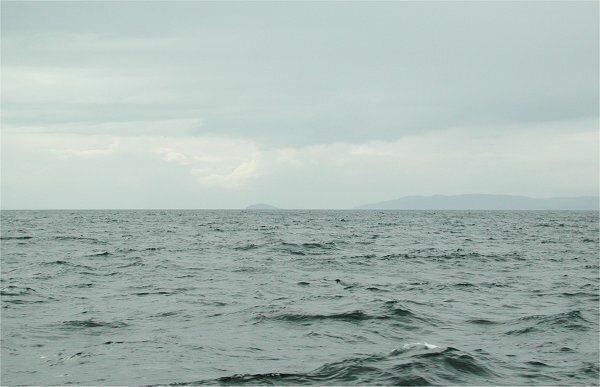 Craig Laggan or Ebbstone marker to the left. 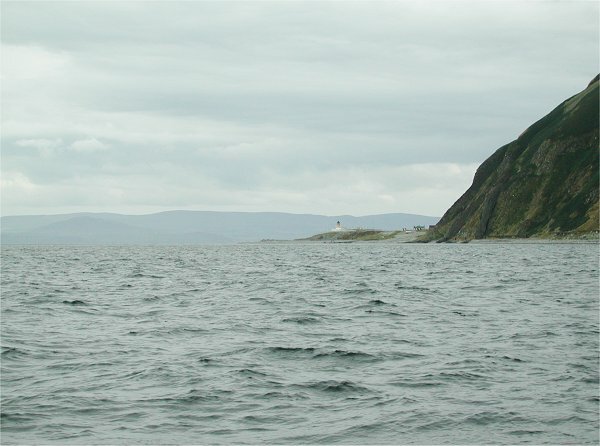 The Rhins of Galloway. 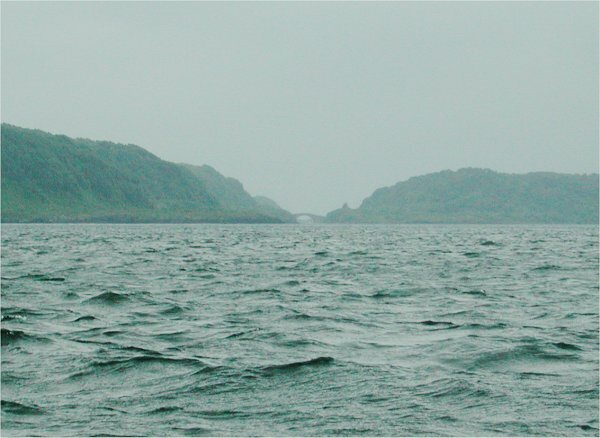 Passage along the Rhins Of Galloway. 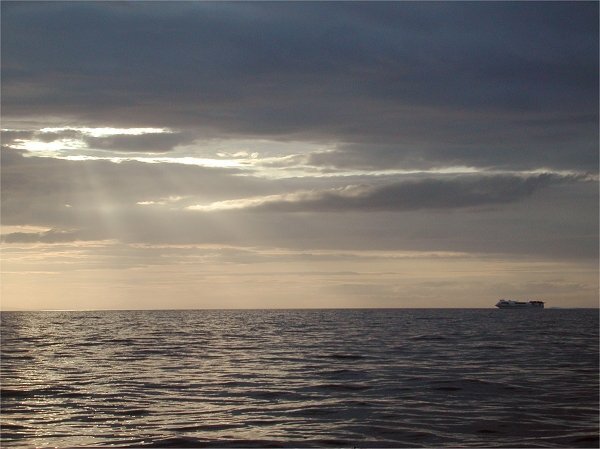 The North Channel settles down to calm seas. It ends up a nice sunset. Portpatrick. 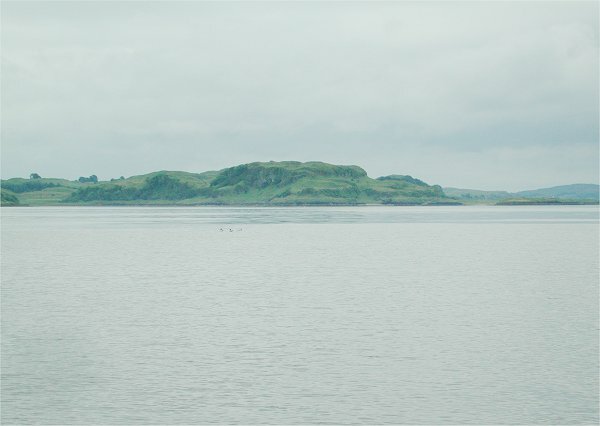 The Rhins Of Galloway. 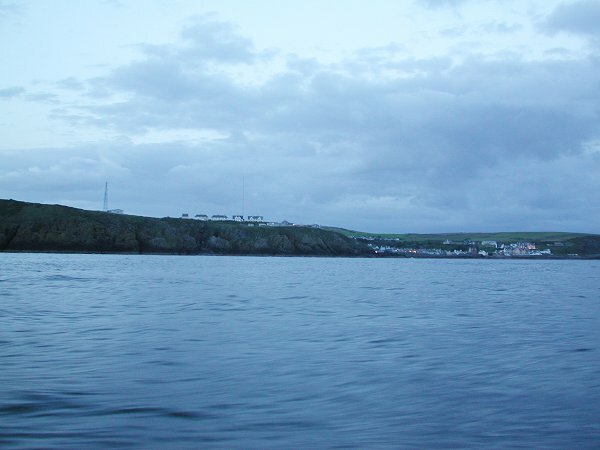 The Mull Of Galloway Lighthouse, the last view of Scotland in the half light.